Hortophile – My New Garden | My New Garden – from scratch! 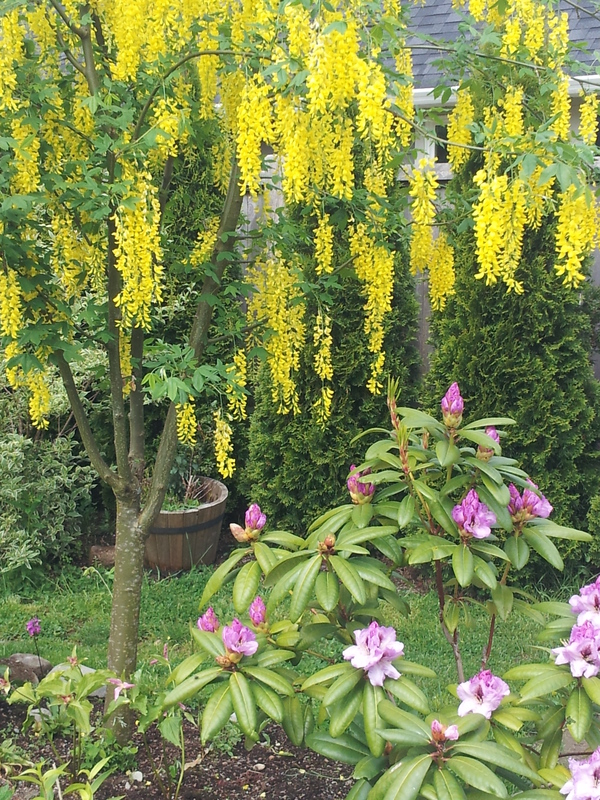 This pretty little tree is another one of my (many) favourite plants. 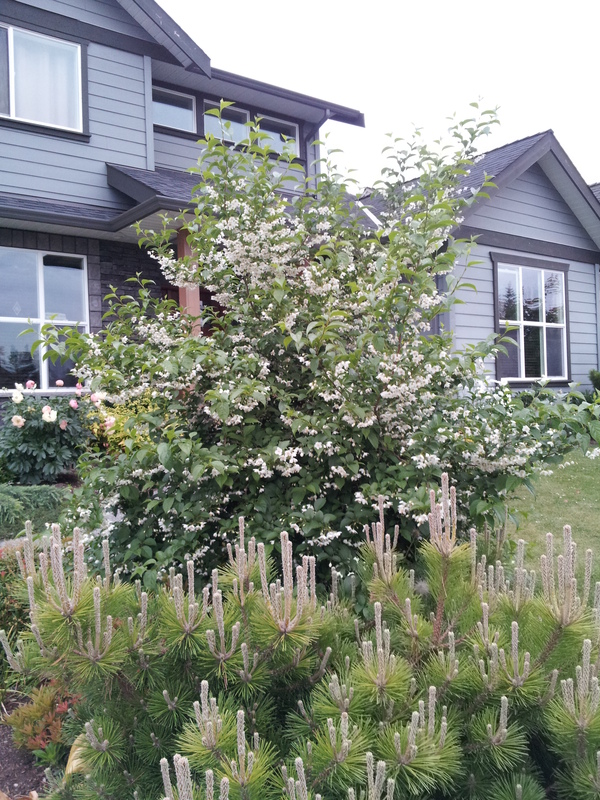 If you are looking for a small to mid-sized, relatively problem-free flowering tree then you should consider planting a Japanese Snowbell. 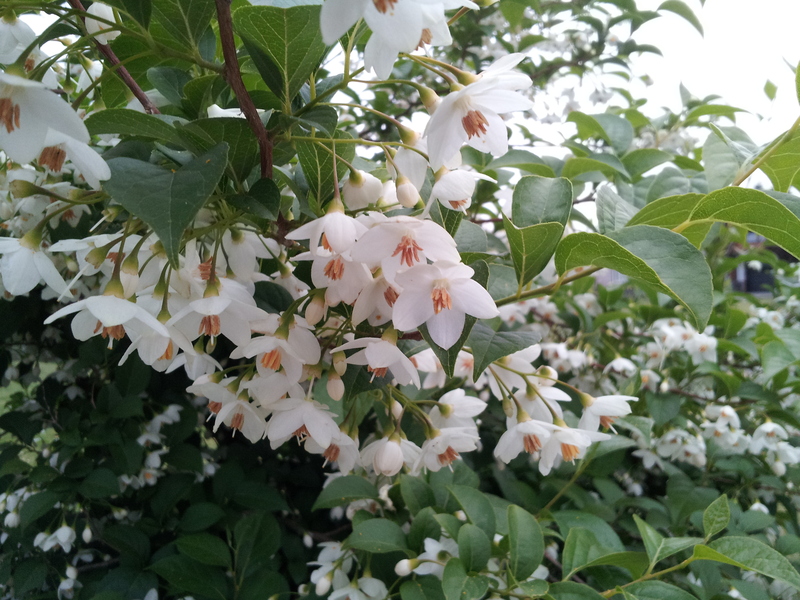 There are more than a hundred species of Styrax but only a few are cultivated, and of these, Styrax japonica (or japonicus) in white or soft pink and Styrax obassia are the only selections I’ve seen available where I live. Styrax obassia, while also beautiful and even more fragrant than S. japonica, seems a little less hardy. I’ve watched a number of S. obassia succumb to a cold winter, but S. japonica is very reliable in my climate (zone 7). It supposedly grows 20-30’ tall, but the largest I’ve seen around here are more like 15-20’. With small pointed leaves on graceful horizontal branches, Japanese Snowbell casts a nice light shade and during June the delicate bell-shaped white blossoms frost the undersides of the branches like white icing on a green layer cake. 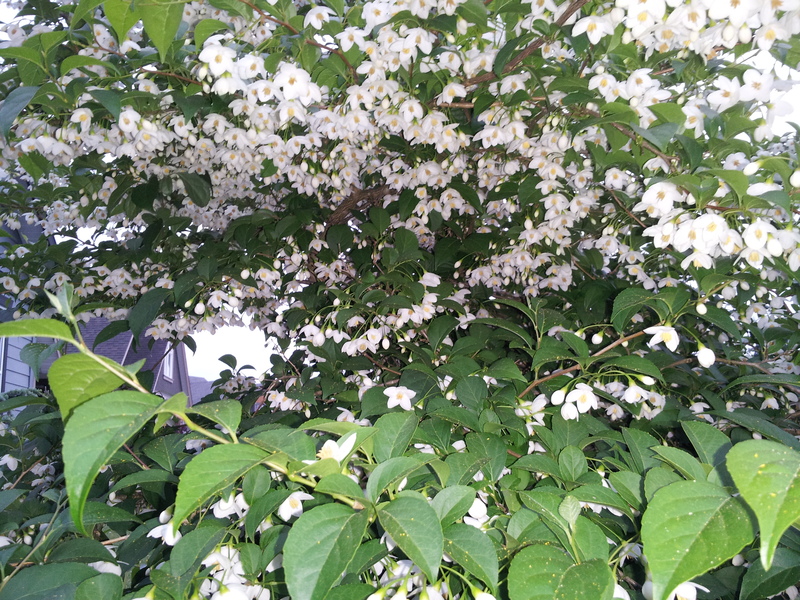 I have always thought that those who claim that their Snowbell is highly fragrant were exaggerating because my tree’s scent is almost undetectable, but just the other evening I was passing by after sunset, during that magical hour when the winds die down as dusk slides gently into night, and a light, sweet fragrance stopped me in my tracks. My little Snowbell was casting its heady perfume into the summer evening, luring the last few pollinators still buzzing around the garden. The first season that I was working at my present garden centre job, I discovered a little Styrax seedling growing among the weeds between the rows of trees in the nursery. 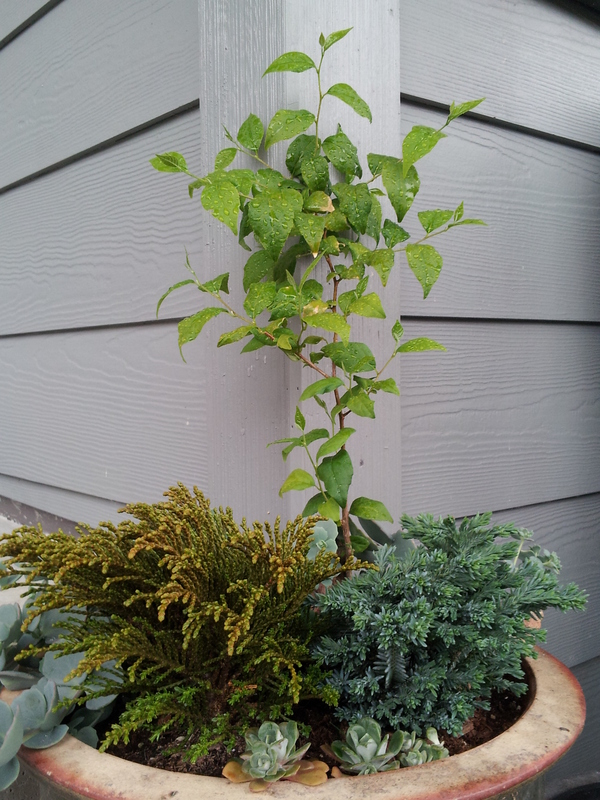 I was supposed to be pulling the weeds anyways, so I pulled that one gently, potted it up and took it home with me… one of the perks of the job! That was 17 years ago and my little two-leaved seedling is now a lovely small tree, despite many years of horrible treatment. This poor tree teetered on the edge of death several times, enduring drought, inattention and occasional physical abuse (puppies and small children). It’s not exactly perfect, lacking symmetry, or even a reasonably straight trunk. In fact, my Snowbell looks rather like a poorly executed bonsai and it has only attained a height of about 7’, but I love it! After the blooms have faded, my Snowbell develops a crop of rock-hard dangling seeds that look like green pearl drop-earrings. The generous display of flowers is well represented by hundreds (thousands?) of these seeds. Fortunately they don’t ALL germinate, or we would be talking about Styrax as an invasive non-native plant, but each year I find a few seedlings under my tree. Here is the next generation, growing (for now) in a mixed planter with Hebe ‘James Stirling’ and a few friends. You’ve probably noticed that my garden lust is generally fulfilled by regular food gardening flings and that I’m tantalized by trees. I’m also passionate about perennials and have an endless desire for deer proof plants, but every year during May, I am amorous for annuals! Yes, those trollops of the garden, flaunting incredible though short-lived beauty, I just can’t resist them, no matter how I try! I will (try to) place the blame for my shameless yearning on my employers at the garden centre, they tempt me by filling the greenhouses with such succulent splendour that I succumb, quivering with delight at the bountiful beauty laid before me. Okay, enough with the alliteration. 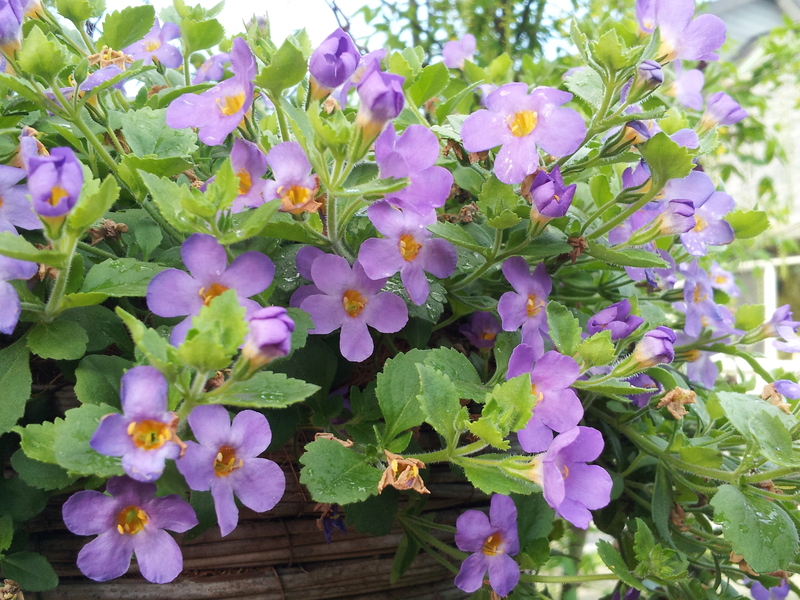 The practical side of me DOES feel a little silly, poring over flats of bedding annuals and basket stuffers that I KNOW will be consigned to the compost at the end of the summer, but I’ve long since abandoned any sense of embarrassment at the depths of my horticultural passion – why bother? Very early this spring on one of my preliminary visits to the garden centre I discovered some new and very beautiful wire baskets that had just arrived with the new spring hardware. I have been on the lookout for a couple of big baskets to hang from my covered patio and these certainly fit the bill, being very large, skookum and uniquely wrought. 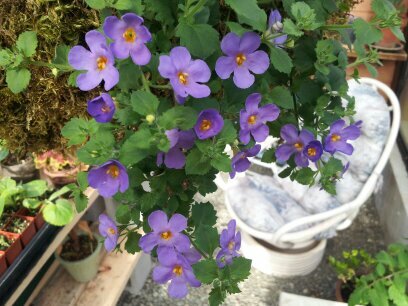 I scooped a pair without even asking the price, brought them home and hung them in my greenhouse to wait for basket planting season. 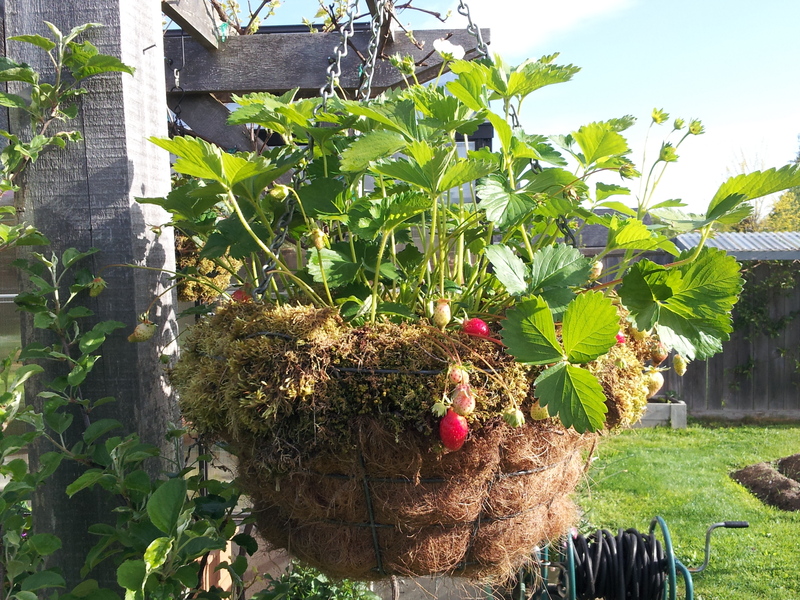 I soon realized that these enormous baskets wouldn’t hang on the small hooks I had installed over my patio, so I had to buy a pair of sturdy wrought iron brackets, wide enough to accommodate the baskets plus some volume of plant material. The costs were beginning to mount, but at least these outlays will continue to pay off for years, unlike what I plan to put into the baskets! 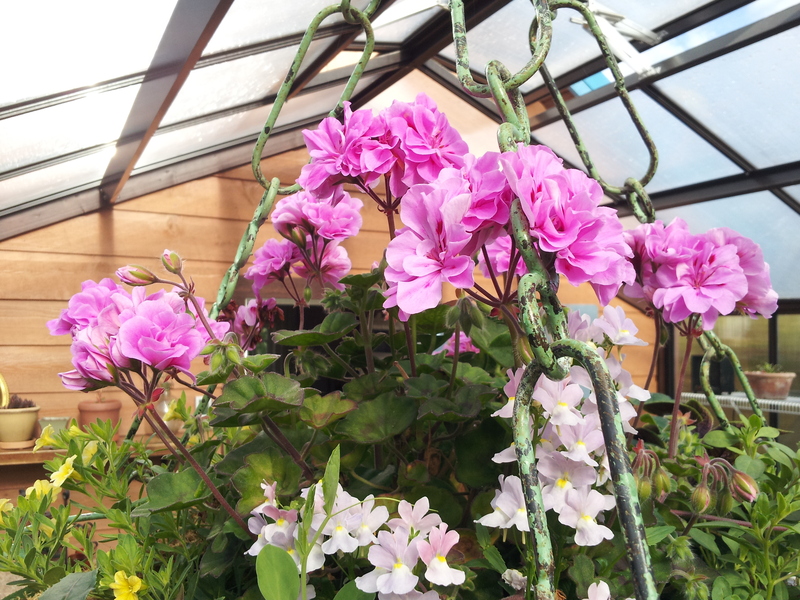 Fortunately, because I was able to overwinter all of my geraniums in my new greenhouse instead of having them crammed together under a grow light in the garage, I had some nice big plants in full bloom to pop into the center of my enormous baskets. I also seeded a flat of dwarf sweet peas, which will hopefully provide colour and fragrance for a minimal cost. This has kept my basket stuffer costs down to a dull roar, but I certainly had to invest in a few beauties to provide diversity in colour and form. Basket stuffers I bought included: • Calibrachoa in purple, red and yellow • Blue Bacopa •Pink and white Verbena • Supertunia ‘Priscilla’ for its lovely double purple veined fragrant blooms • Light purple Osteospermum •Nemesia ‘Pearl’, and a couple of foliage plants To the lightweight potting mix I added alfalfa pellets, bone meal and some 14-14-14 slow release fertilizer( which isn’t organic, but I’m not planning to eat anything in the baskets, so I’m okay with it). I hope I am organized enough to provide regular lashings of a water-soluble fertilizer as well, over the hot summer months these baskets will require regular watering, which tends to wash nutrients away and the sheer volume of plants within a small basin of soil also demands extra nutrition. 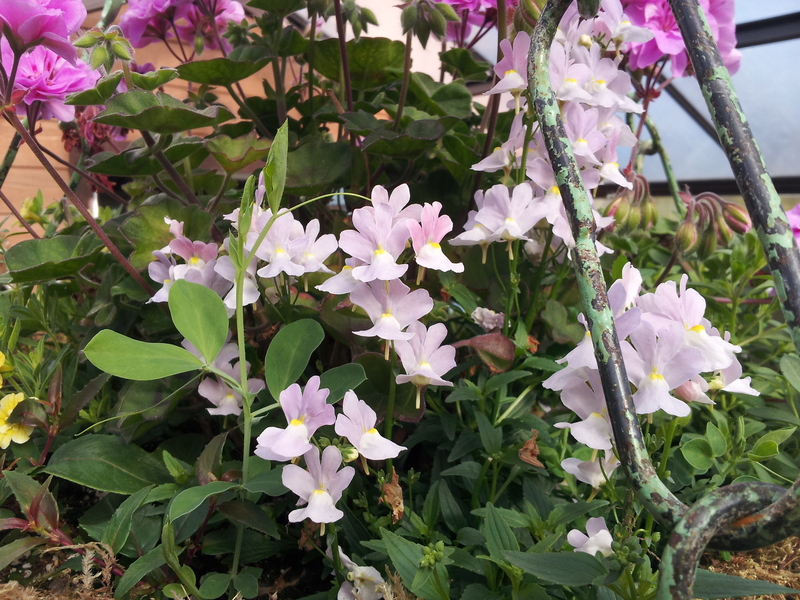 Usually, by late summer I start to fade in my dedication to fertilization, after all, they are just annuals, destined for the compost in a few months… Except that I will want to save the geraniums and I’ve also had good luck getting some other ‘annuals’ to overwinter with protection. 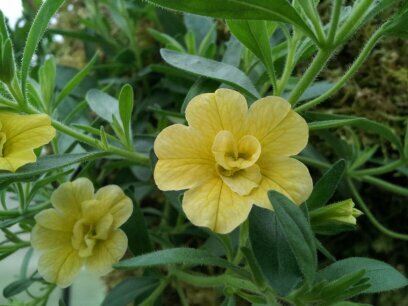 Many of the plants sold as bedding annuals are actually perennial, just not in our climate! 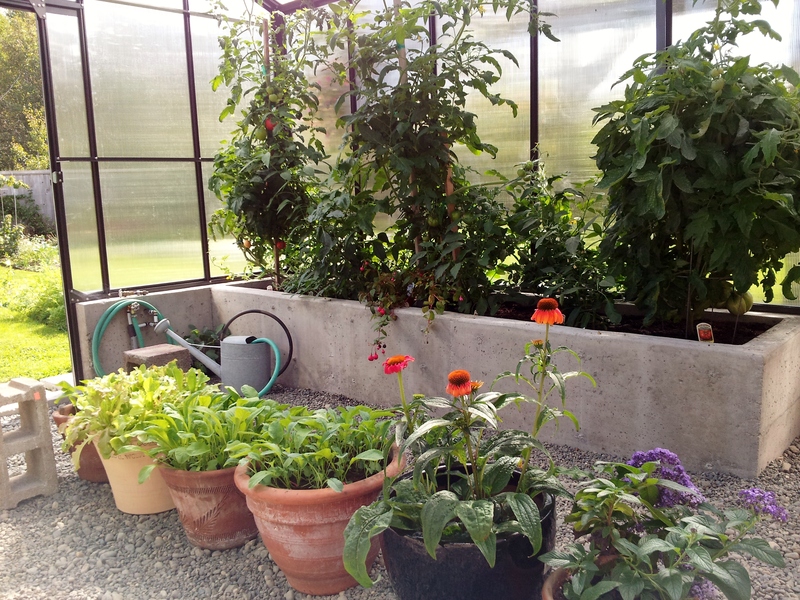 Most likely I will pop the baskets into my greenhouse come fall and see what survives. 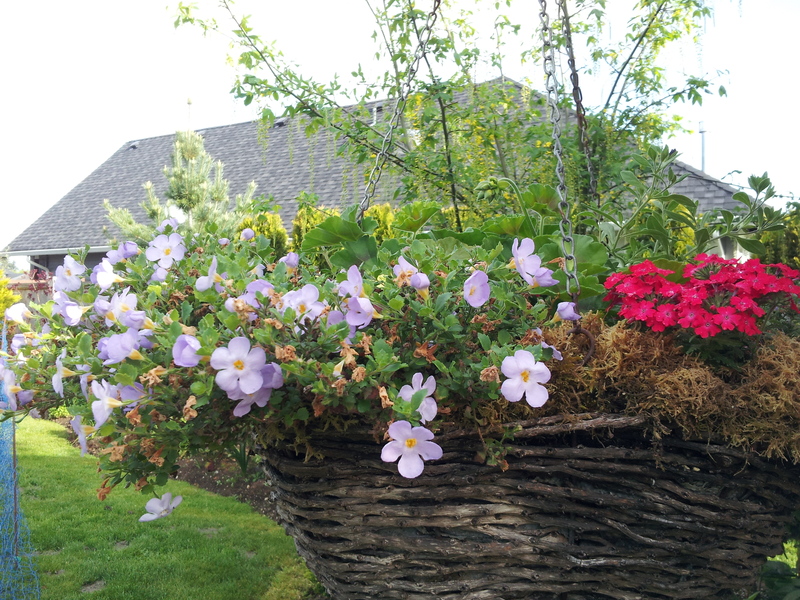 I hope my big baskets will become a riot of colour and scent with a bit of a cottage garden feel to them, which isn’t really the style of my garden, but that’s what I felt like doing this year and somehow the baskets themselves suit that style. That’s the beauty of annuals – next year I can go in a completely different direction if I so choose. 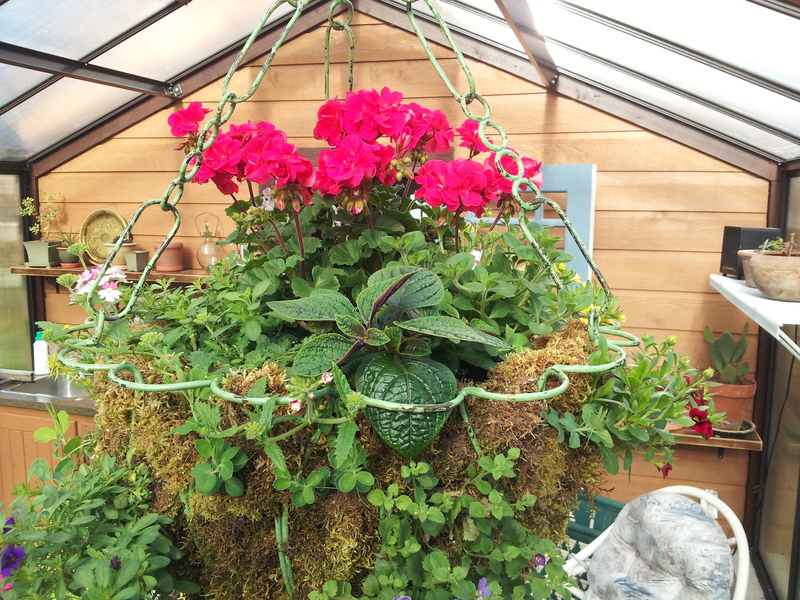 Not ALL of my hanging baskets are frivolous flowers! Every year I experiment with at least one new tomato variety. 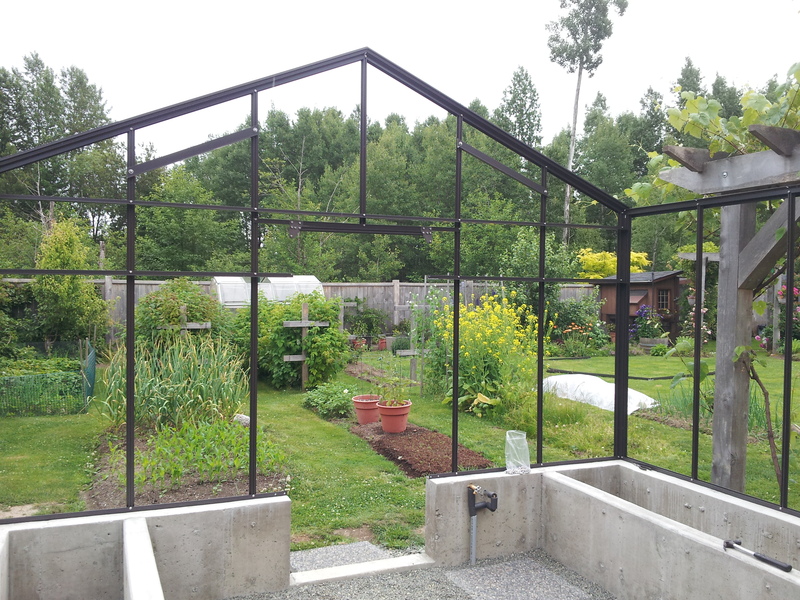 In 2013 it was only one variety because I was in the midst of building my new greenhouse and pressed for space and time to garden! I chose the heritage paste tomato Sicilian Saucer because I like a big, meaty, flavourful tomato for making delicious roasted tomatoes. 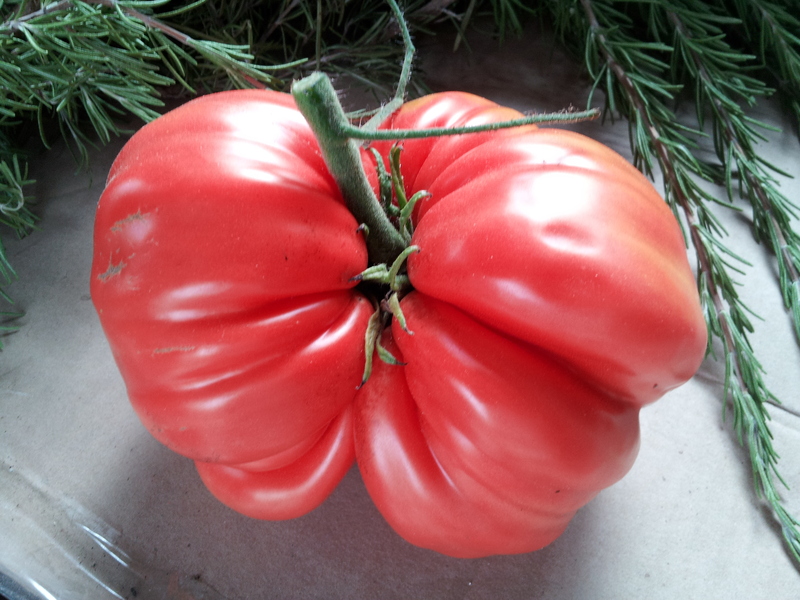 Sicilian Saucer is an Italian heirloom tomato producing giant, heavily lobed, beefsteak type fruit. 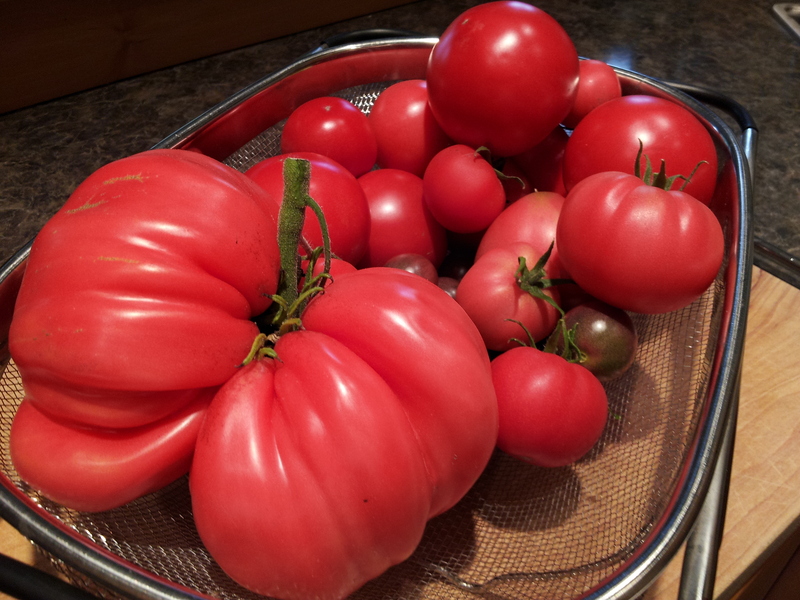 I’ve grown other Italian heirlooms like Costoluto Fiorentina and Costoluto Genovese and always been impressed with their rich flavour, so my expectations for Sicilian Saucer were pretty high. This variety is supposed to be an indeterminate variety, I guess it was in that it never stopped growing, but it certainly didn’t grow up! After growing to about a metre tall it then proceeded to put on all sorts of crazy vegetative growth from every leaf node except the topmost. The plant exploded sideways! It certainly didn’t help that I didn’t have time to keep up with pruning it. After a few cursory attempts to remove the suckers and force terminal growth I lost control and before I knew it I had a bushy little troll of a tomato plant. That single tomato grew, and grew, and grew! When I finally picked it in mid-September it was immense and so heavy that I knew it would be richly flavourful. I don’t have an accurate kitchen scale but it must have weighed at least a kilo. I decided to use it in a batch of roasted tomatoes and when I dismembered it into large chunks I was surprised to find that it filled the glass dish I usually roast my tomatoes in. 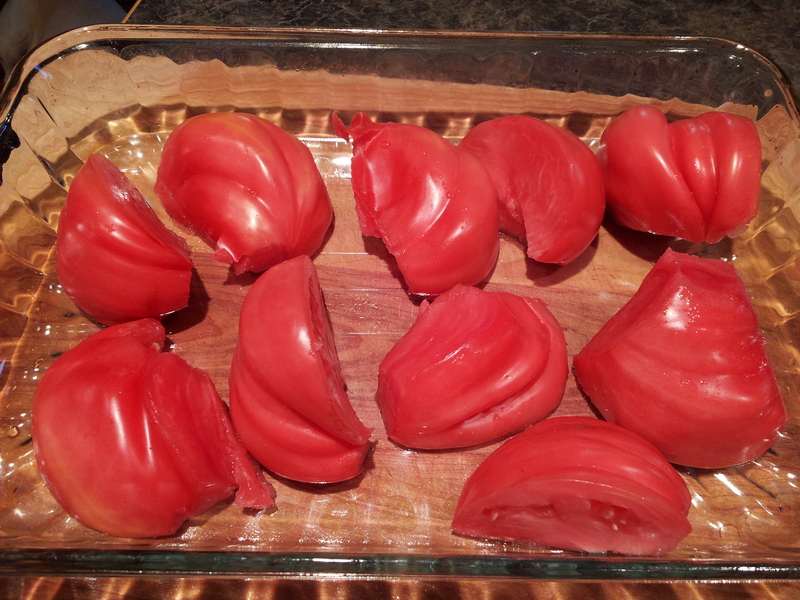 The bloody thing made an entire batch of roasted tomatoes all on its own… and a big batch it was too! Yes, that’s just ONE tomato! The plant has produced a few late fruit but I’m not sure that they are going to ripen, even if I bring them inside, they’re just not very well-developed and it’s getting pretty cold in the greenhouse, I don’t have my heater installed yet. 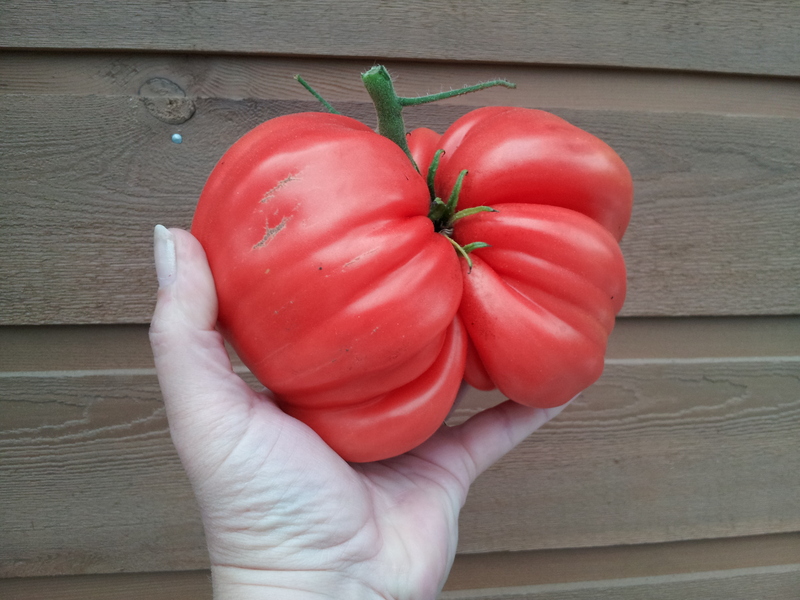 Sicilian Saucer certainly produced one doozy of a tomato, but I don’t think I’ll grow it again. 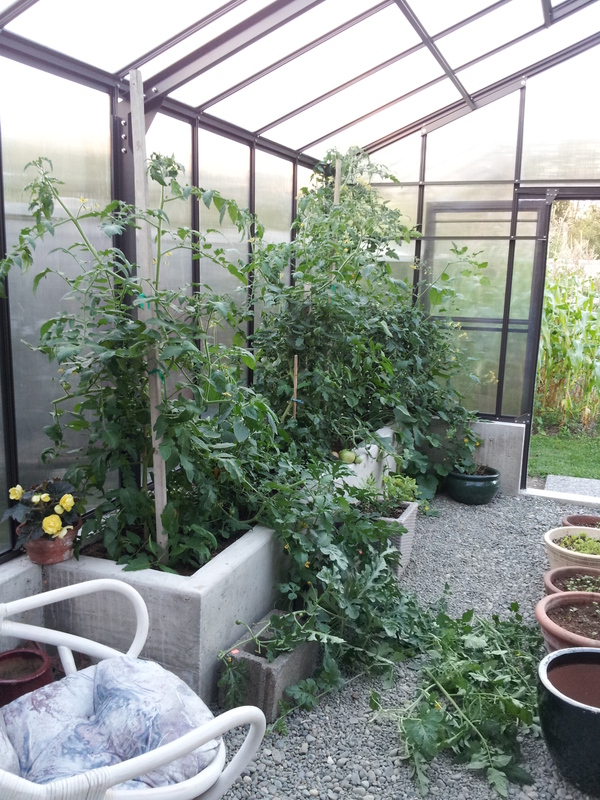 I’m not giving up that much space in my greenhouse for one tomato, no matter how large and tasty! 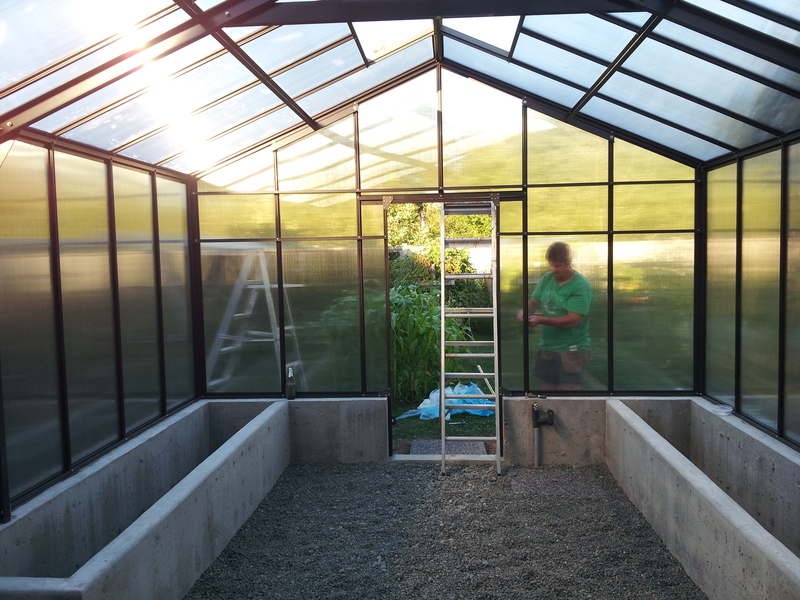 The day we glazed the greenhouse I was so excited that within minutes of finishing (literally!) I jumped into my truck and headed to Brymik Earthworks for a load of fish compost. 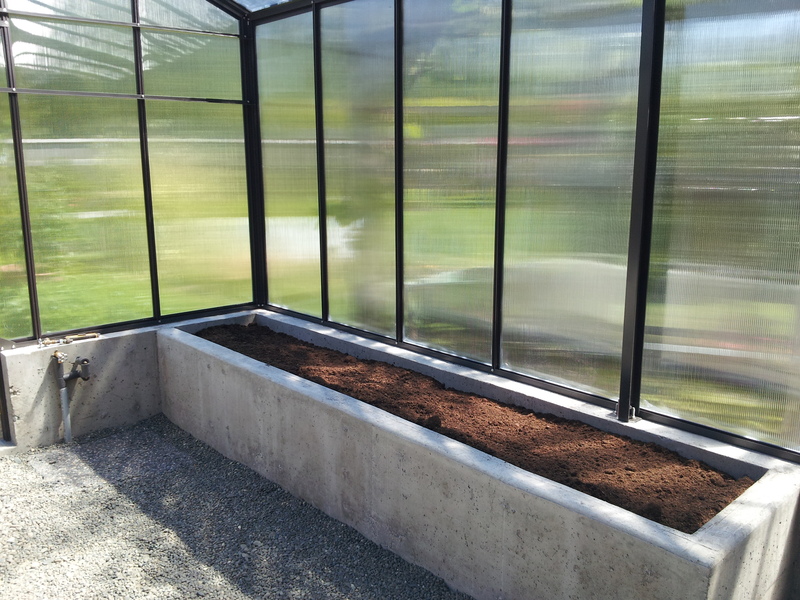 Before the end of the day we had the planting beds inside the greenhouse filled with a mixture of peat moss and fish compost. 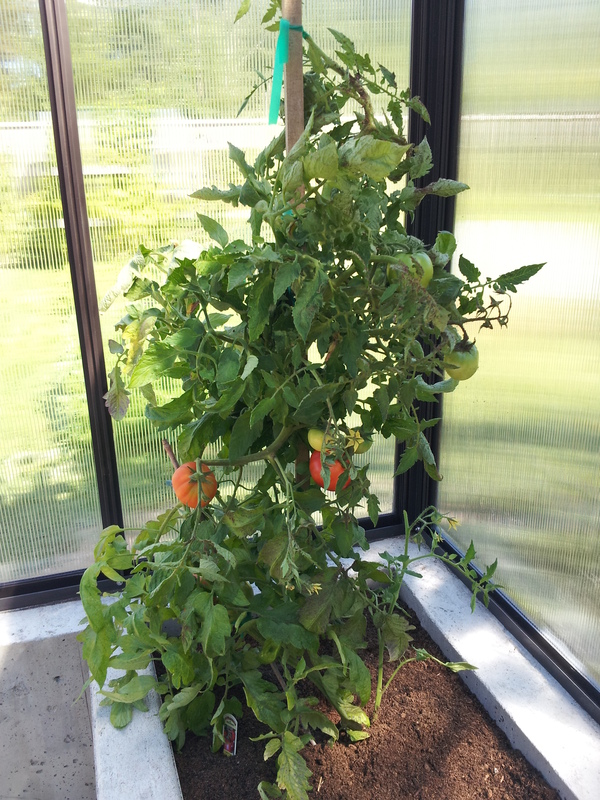 The tomatoes were already pretty big and healthy and had fruit set and ripening. My peppers and melons, however, had been held for too long in pots that were too small for them. The peppers were dropping yellow leaves and the melon vines were stunted and stressed. For your edification, I will now demonstrate the effects of excessive nitrogen in the controlled environment of a greenhouse. The next set of pictures was taken on August 23rd, a little less than 5 weeks later. 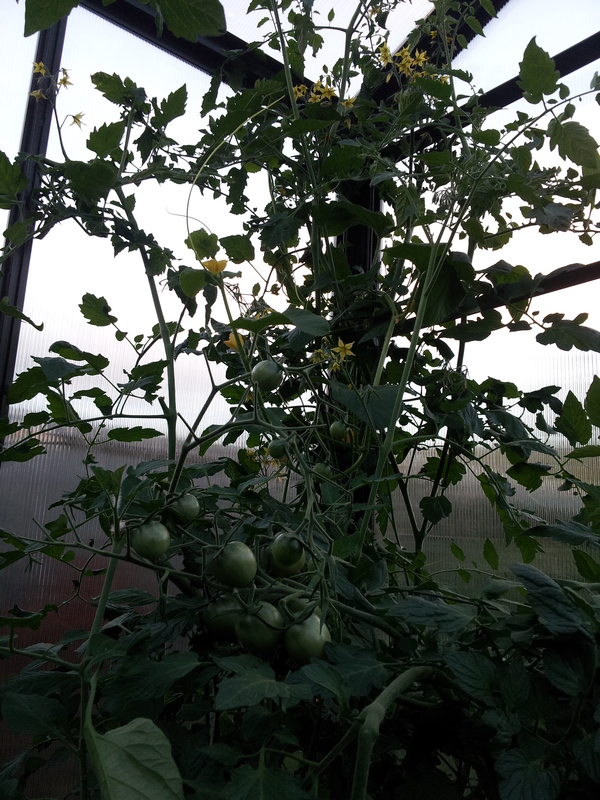 Black Cherry Tomato – hitting the greenhouse ceiling! Talk about green!! If you can believe it, I had just pruned a wheelbarrow’s worth of leaves from my tomatoes prior to taking these shots… I wish I’d thought to take some pictures before I pruned, but the difference is still pretty striking! The compost in my beds is clearly rich in nitrogen, and while the tomatoes are thriving, neither the peppers nor the melons are fruiting well, although they are growing like mad. In fact there are exactly 0 melons on the 1 cantaloupe and 3 watermelons I planted. The peppers are faring a little better, they had already set some fruit before transplanting and those have developed and ripened, but all the growth since July 21st has been vegetative, and now, in September, they are just starting to flower and fruit again. I wonder if these peppers will ripen before it gets too cold. The fall/winter veggies I seeded are also growing well. Most of these are salad greens; lettuce, komatsuna and spinach, with a few radishes chucked in for good measure. 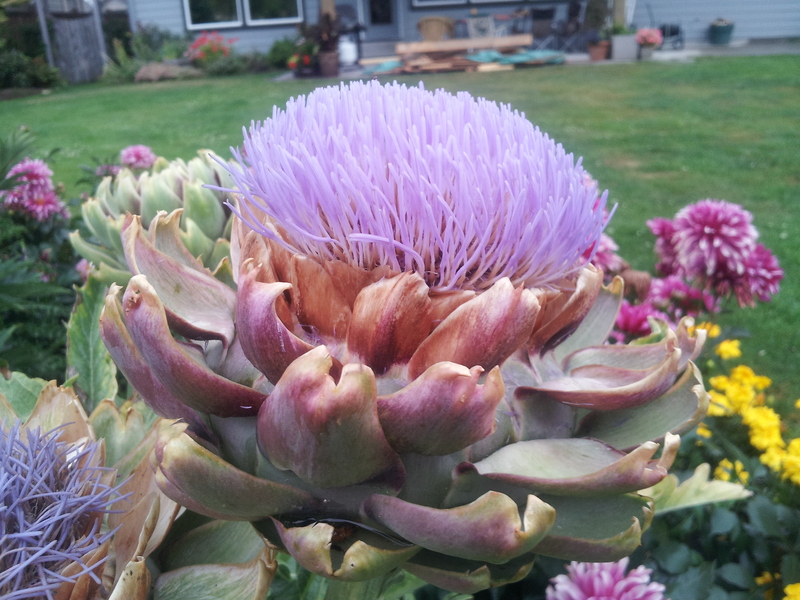 They are using the surplus of nitrogen to size up rapidly with tender, succulent growth. Time for some fresh salad! I should probably pull the melons out, but I kinda think it’s not a bad idea to let them siphon off some nitrogen first. They will deplete it (somewhat) from the soil so that next year the soil chemistry is more balanced (I hope). 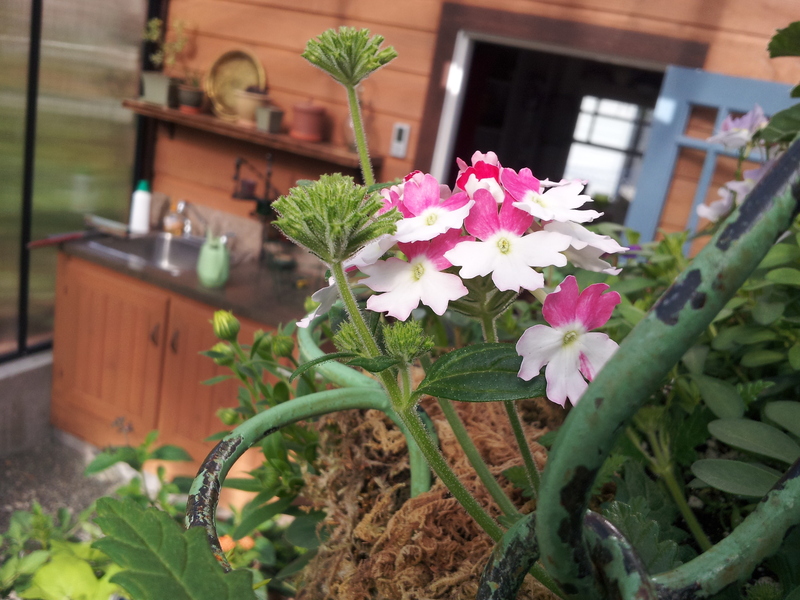 Those nutrients won’t be wasted; I’ll compost the plants and they’ll end up somewhere else in my yard… the circle of life in a micro-system (my garden). 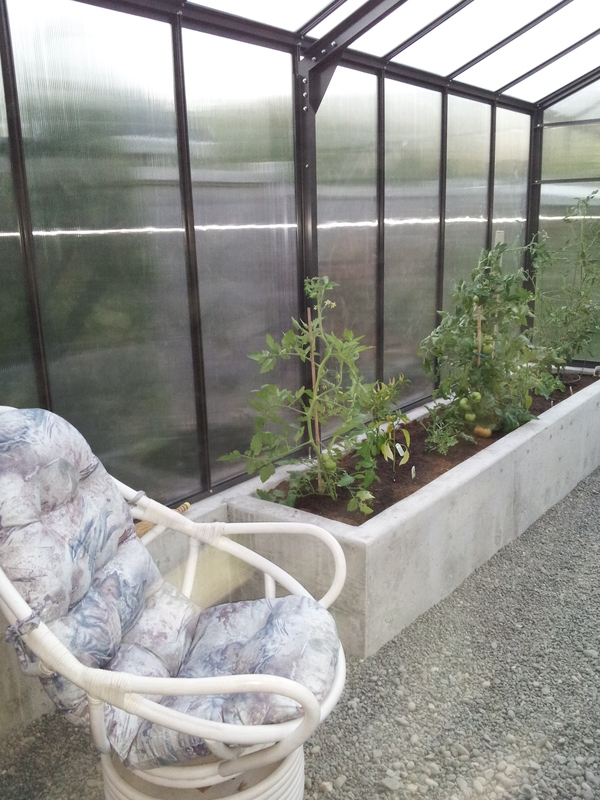 Finally, the greenhouse is up and running! 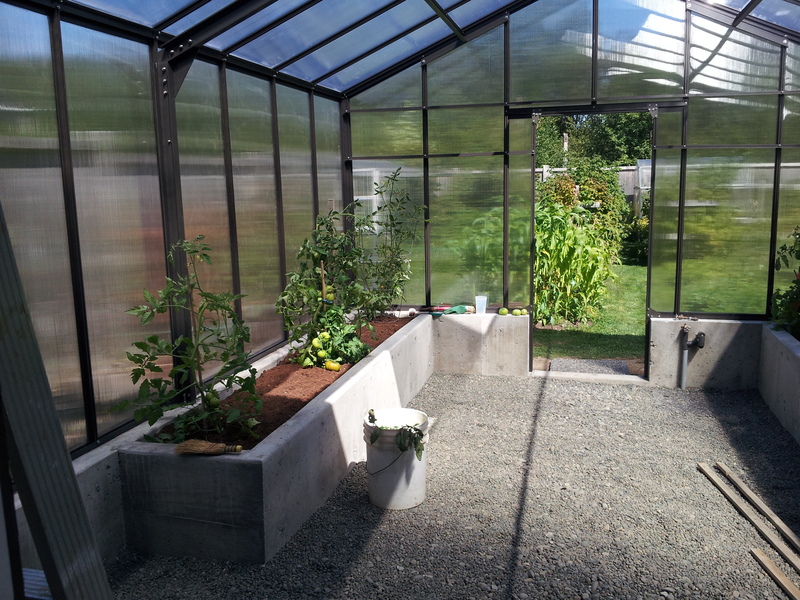 Within a few hours of installing the polycarbonate panels I rushed off to the soil mart to fill my little truck with fish compost for the planting beds and transplanted my pot-bound tomatoes, peppers and melons into nice rich soil. They are so happy, they are growing like crazy! My peat moss/fish compost blend is probably a little nitrogen rich, the plants greened up almost immediately and are producing tons of vegetative growth, probably at the expense of setting more fruit. 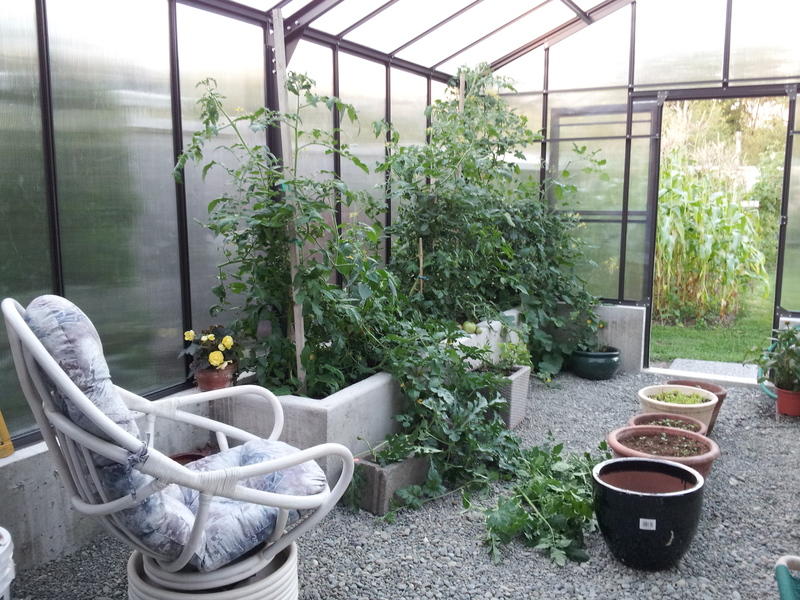 Fortunately the tomatoes and peppers had already set a decent crop before they were turned loose in the greenhouse. The melons might not fruit, but melons are always a crapshoot around here anyways. 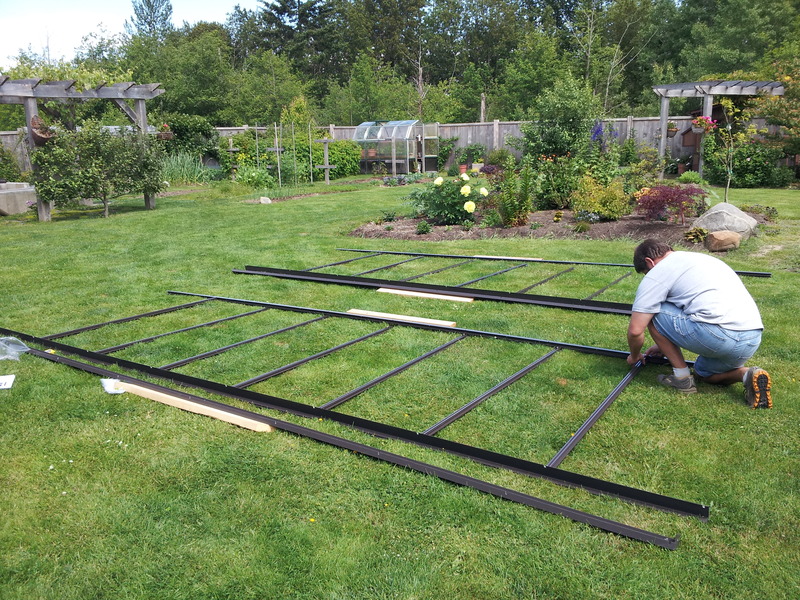 The construction of the greenhouse went pretty smoothly, we did have to back up a couple of times when we put things together backwards or upside down, but it all became apparent before we went too far in the wrong direction. Now that we have one under our belts, I’m sure we could repeat the process in half the time. 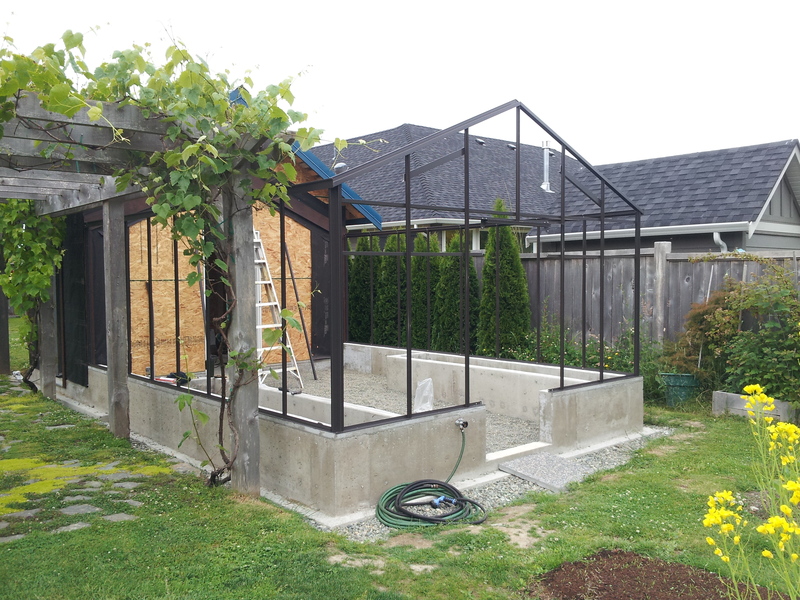 Once again I have to thank Russ Davis, the agent for BC Greenhouse Builders on Vancouver Island, for his prompt responses when we had questions during construction of the greenhouse. A couple of times I took pictures and emailed him with a question when we were stumped. He must monitor his email constantly because, without fail, he had an answer for us almost immediately… like within an hour! That’s incredible service. 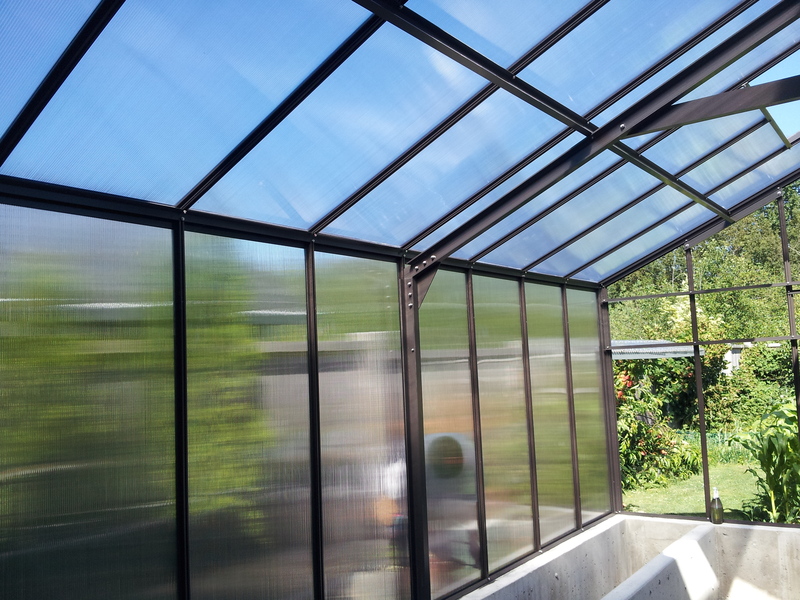 We have installed (yes, that ‘we’ means HE) the automatic vent openers that came with the greenhouse and they are working admirably. 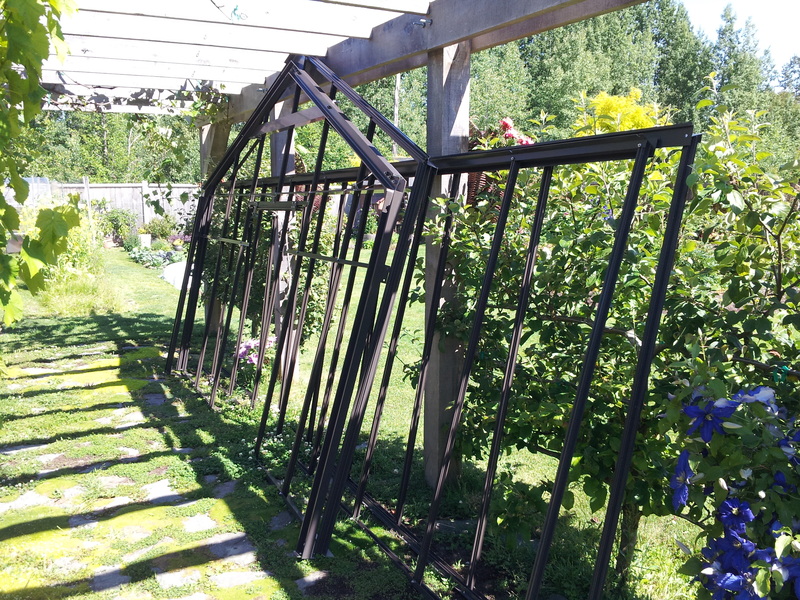 I hope that with four big vents, a door in either end and a little shade on the south side (provided by my pergola and grapevines) and the west side (provided by the shed) I can avoid using shade cloth during the hot summer months… time will tell. 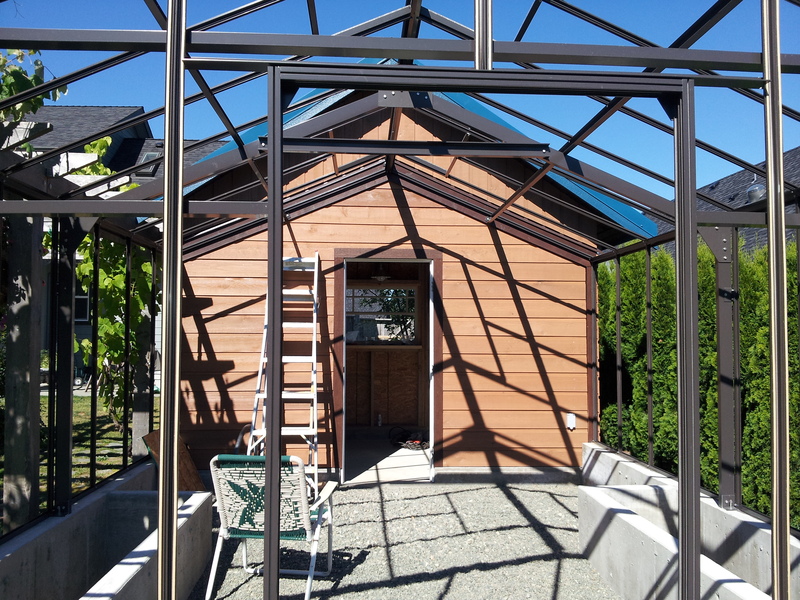 There is a little cedar siding that needs installing on the shed, the cabinet and sink in the greenhouse is not yet finished, and I have a bunch of painting to do (yes, that’s one job that I CAN do) before the project is complete, but the greenhouse is functional. We will putter away on the finishing touches over the remainder of the summer. My super comfy rattan swivel rocker is tucked into a corner, where I can put my feet up and contemplate life while watching the tomatoes grow. Lucky me! 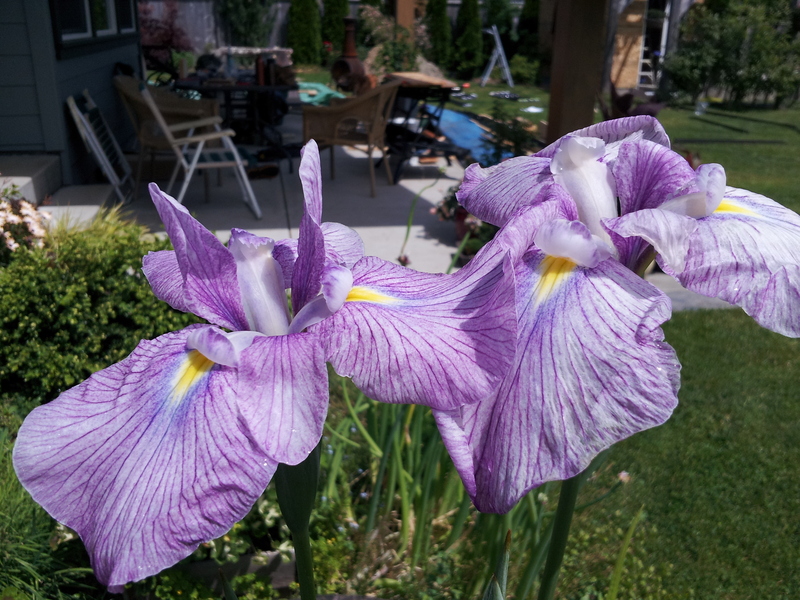 Lovely Japanese iris – and just look at that construction debris all over my patio! Well hello there, how are you doing? I know, it’s been awhile, but I’ve been busy! I did give out a few hints about that, so I hope you weren’t too surprised. Finally my hectic schedule has subsided and I’m getting back on track in a number of ways, including picking up my blog again. So what exactly have I been doing? Well, my personal life shall remain just that, so if you don’t actually know me in real life, you don’t need to know the details. 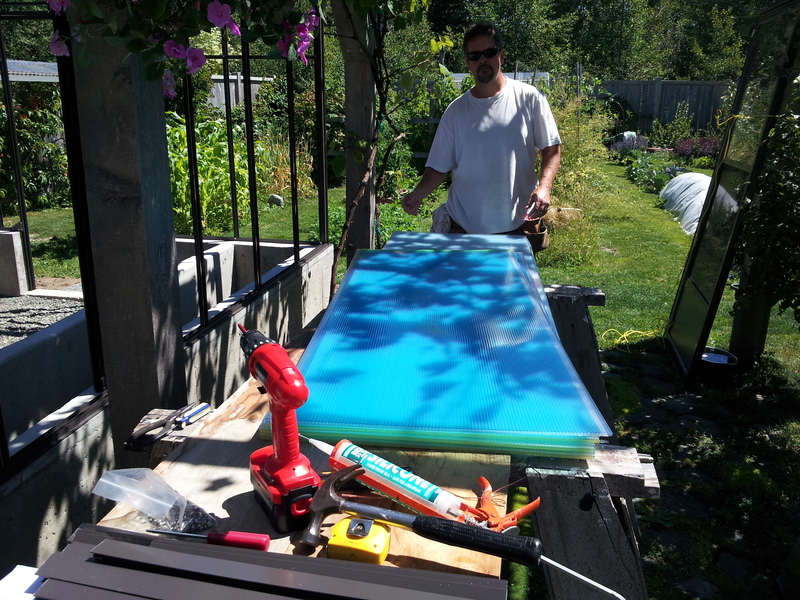 In the garden, I’ve been working on my greenhouse and oh, it’s just wonderful! 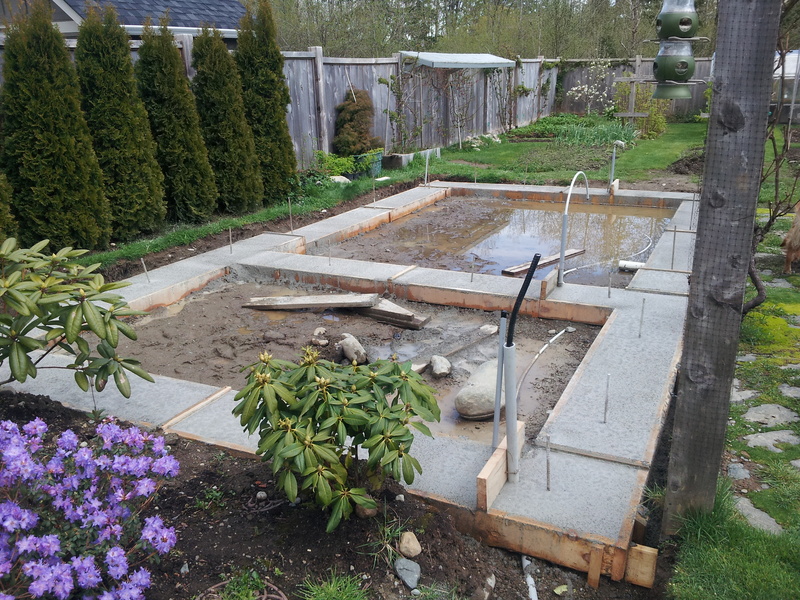 Unfortunately the rest of my garden has suffered this season as most of my ‘yard time’ has been taken by this construction project. 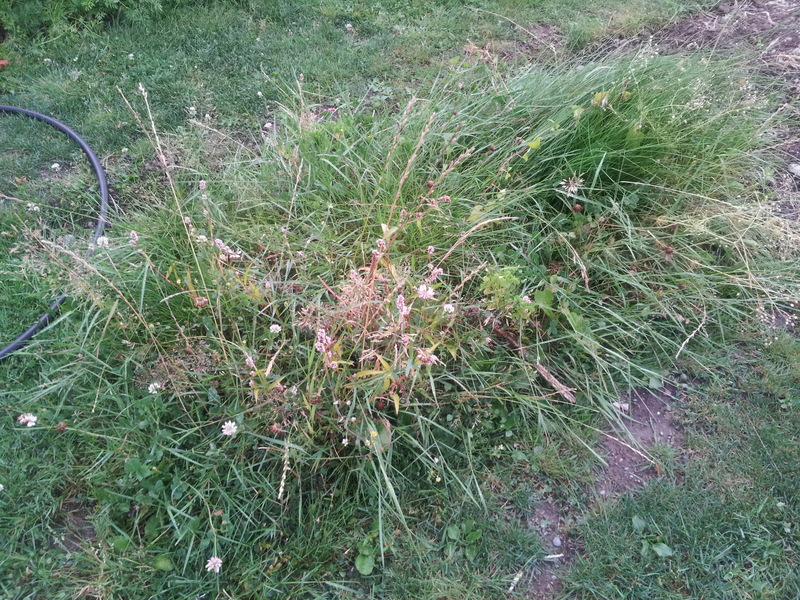 Weeds run rampant through my garden and those veggies that I’ve hastily chucked into the ground this year are suffering. They are competing for space as well as nutrition because I’ve totally blown it on the fertilization front. A few spots got some compost and once or twice I gave some of the veggies a drink of seaweed fertilizer, but for most, it’s been a ‘fend for yourself’ kind of season! There is even one part of the veggie garden that didn’t get planted at all this year; it’s a riot of weeds. I’m calling it my beneficial insect haven. I read somewhere that it’s a good idea to let a corner of your garden go wild to create habitat, yup, that’s my excuse reason! Somebody must have told the birds that I’m not paying attention because they’ve almost stripped the blueberries from the bushes. Last year, the arrival of a vicious kitty seemed to keep them at bay, but they must have her all figured out – she’s still out there stalking them, but they are working around it. I keep thinking that I should throw some netting over the plants, but can’t seem to find the time to do it and now the blueberries are almost gone. It’s a shame too, the wonderful weather we have had this year means a bumper crop of berries of all kinds. I’ve been feasting on raspberries, strawberries and loganberries, now the blackberries are starting to ripen, yum! 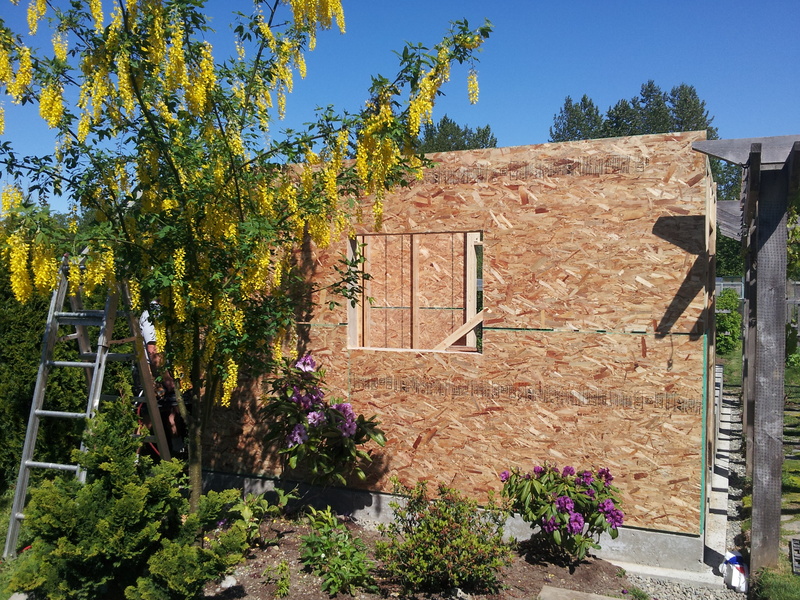 The first greenhouse wall is up! 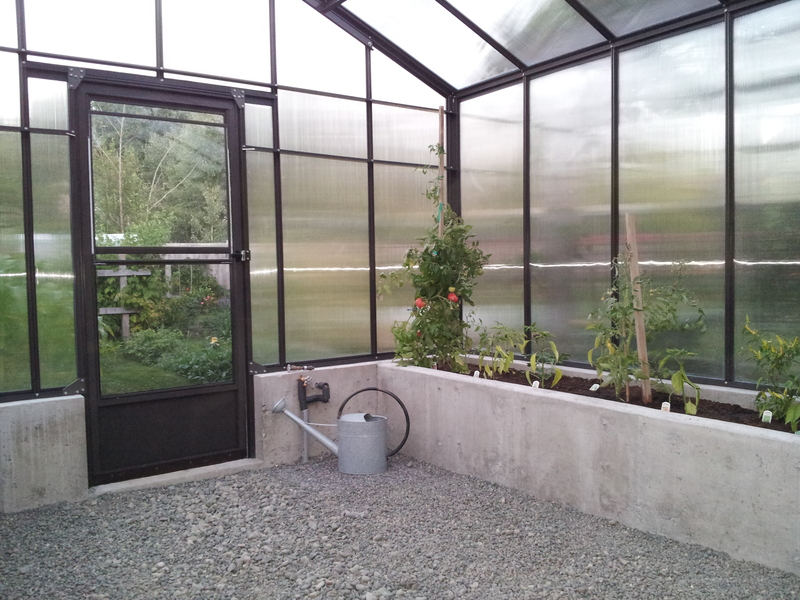 The greenhouse is coming along nicely; I can hardly wait to get some plants in there. 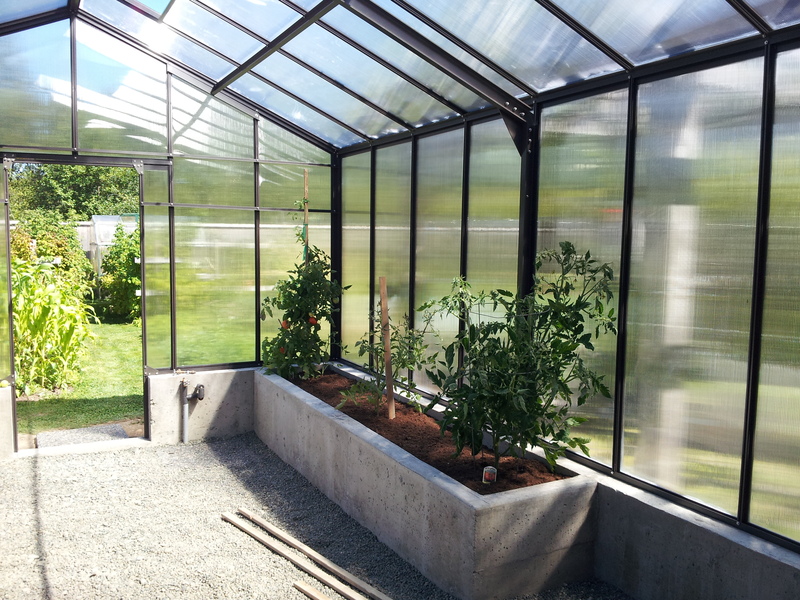 I’m really looking forward to growing some fresh greens this fall and winter – and the dogs won’t be able to eat them (as long as I close the greenhouse door). 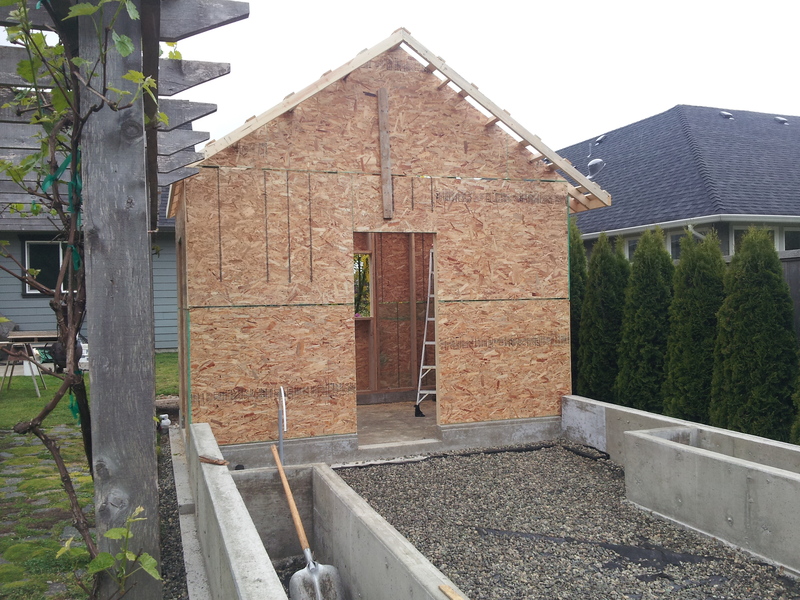 I’m kinda exhausted… too tired to write an ode to shed construction, so I’ll just show you our progress in pictures. I love the smell of fresh lumber! I love the blue roof! What a lovely spring we are having here on the west coast! 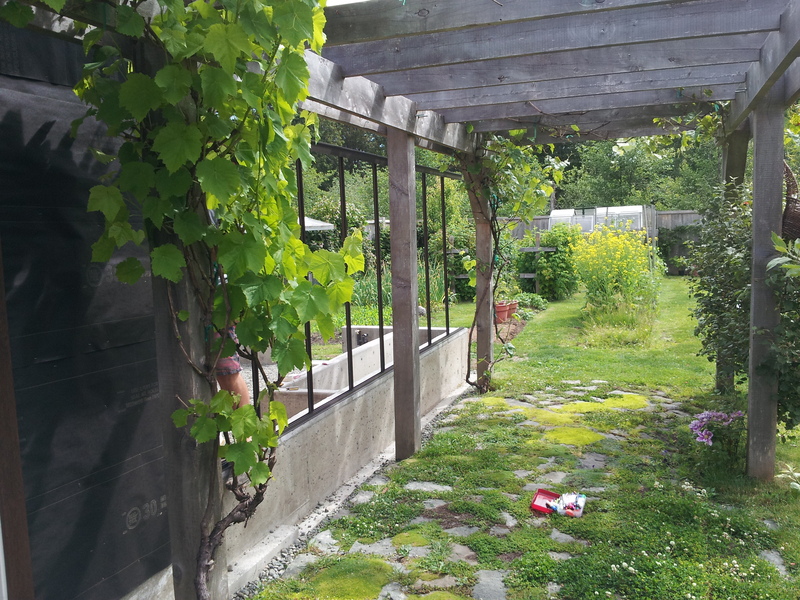 Beautiful BC indeed; mild temperatures, even a few record-breaking HOT days, interspersed with just enough rain to keep the garden happy, we have no complaints this year. Unfortunately I’ve had precious little time to enjoy it, between work, kids, the garden and of course my greenhouse construction project. 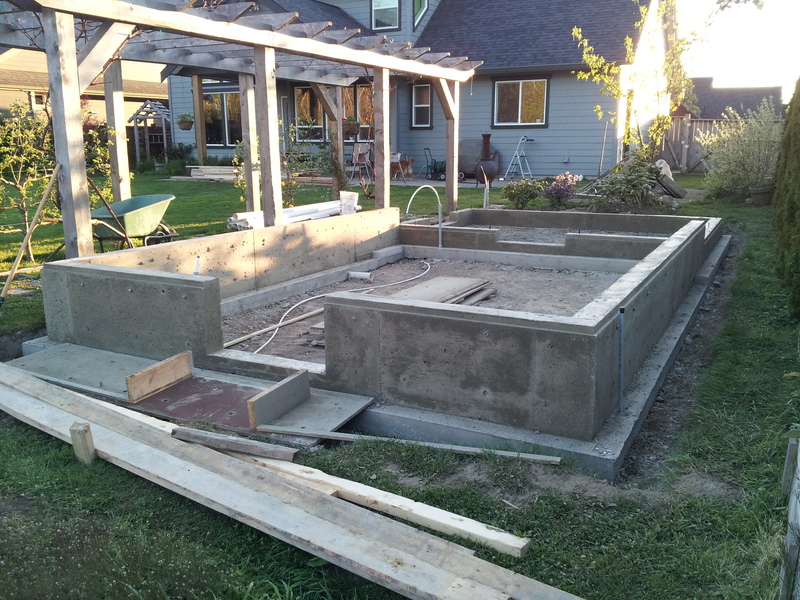 I’m happy to report that the concrete work is finished… three separate pours later! 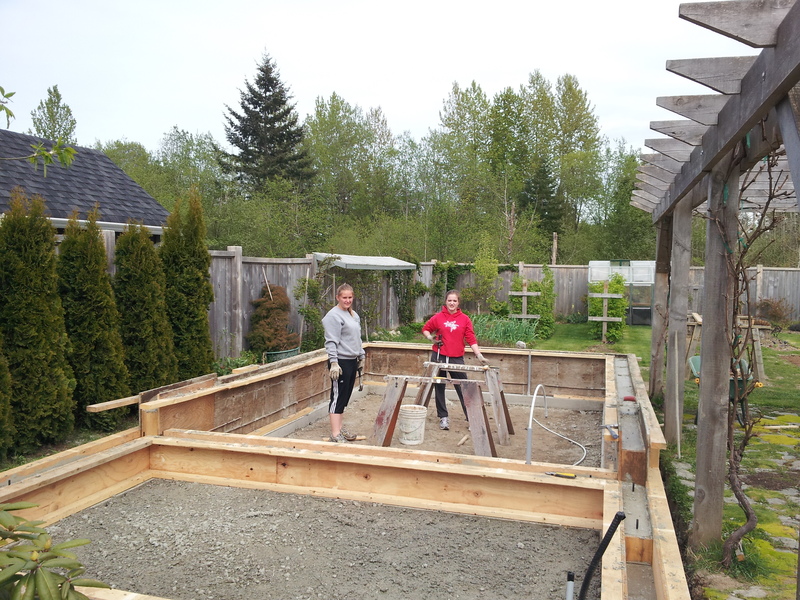 First we formed up and poured the footings, then the foundation itself, then finally the planting beds inside the greenhouse and my shed floor. 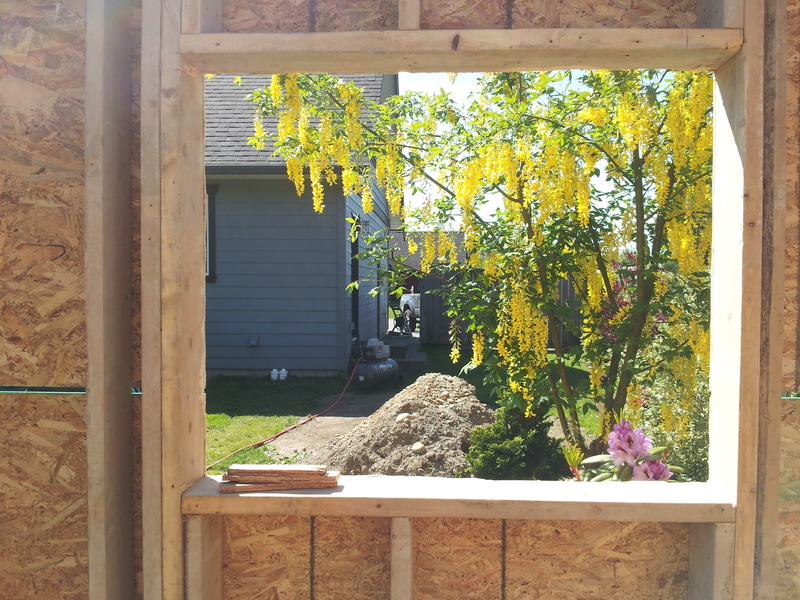 My deconstruction crew – helping to strip the forms! 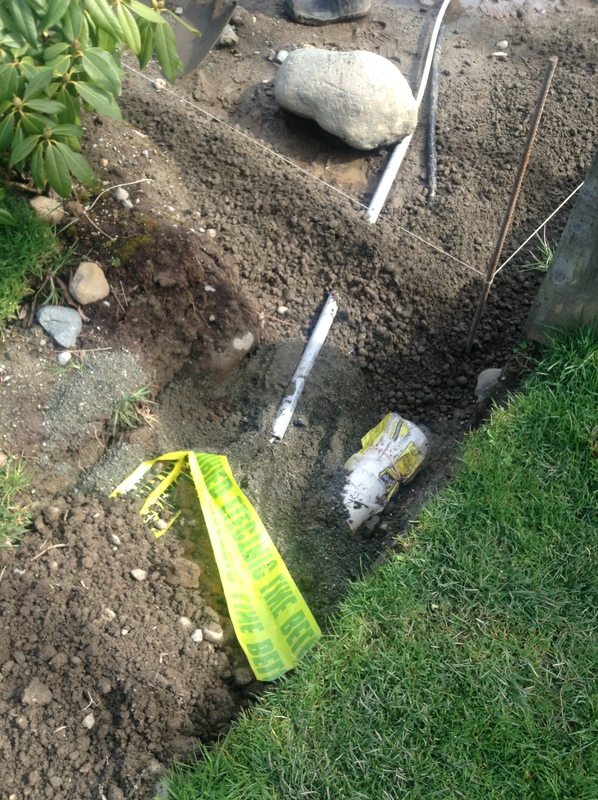 Many loads of drain rock, perforated pipe and fittings later, we are (almost) ready to begin building. I am a little surprised at how much work has gone into the foundations, but very pleased to know that it’s all done properly so that the structure will be sound and last for a long time. 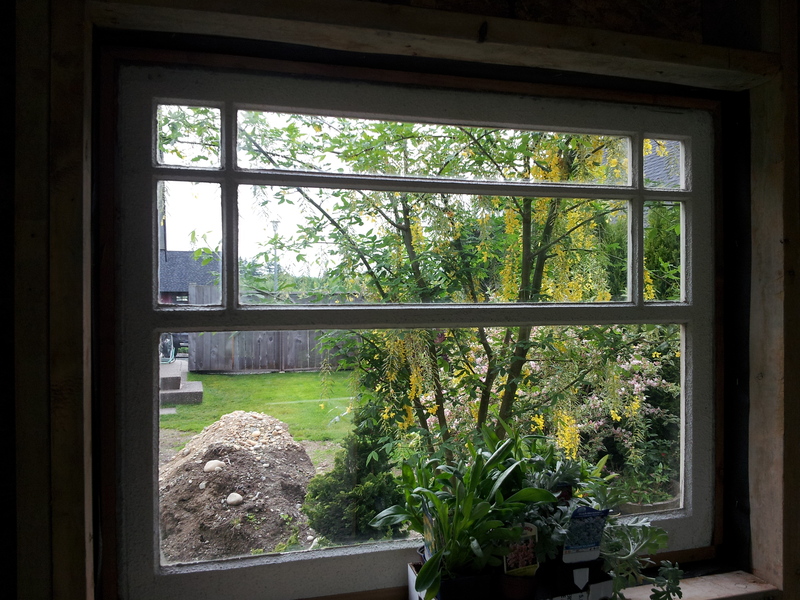 My Laburnum tree and two different purple rhododendrons (Arthur Bedford and Jonathon Shaw) are blooming in the garden bed just in front of the ‘shed’ right now and I’m imagining what they will look like next year against the backdrop of my sweet little shed/workshop. 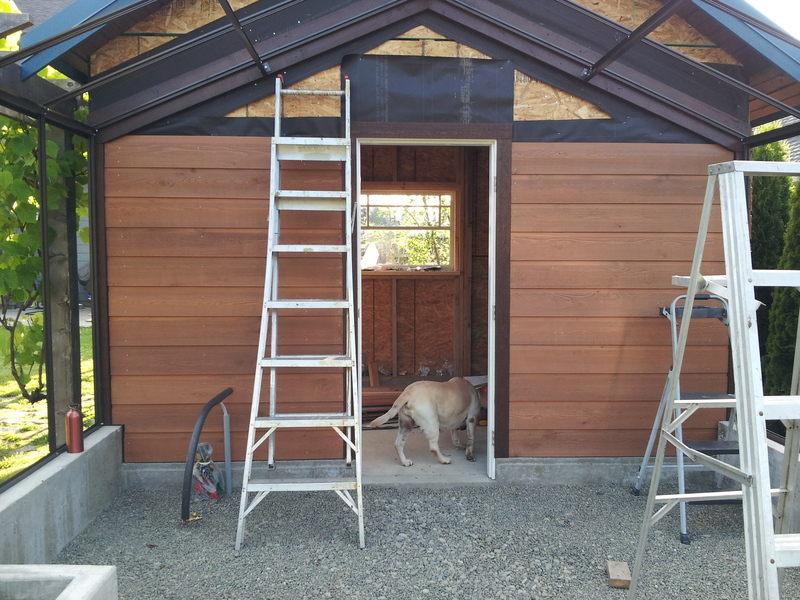 Today our contractor was here firming up the shed plans and making a materials list, time to go shopping! 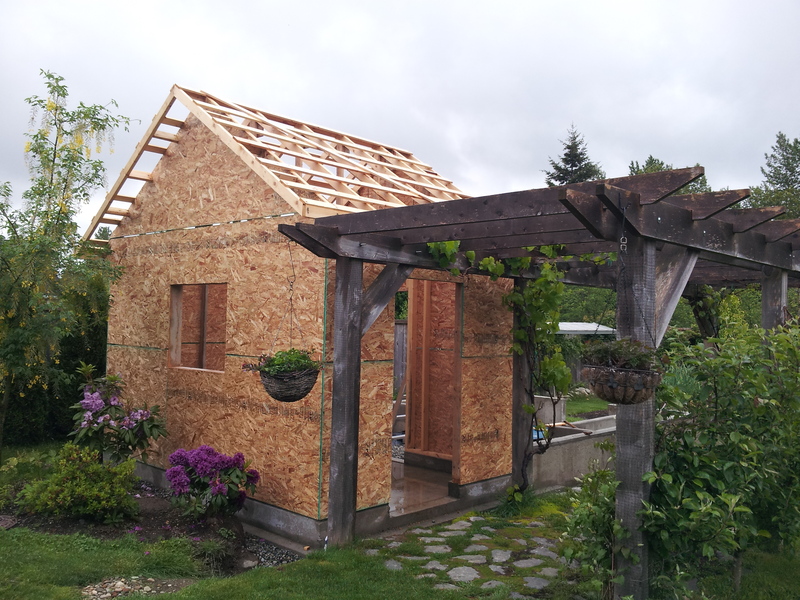 I’m not usually so happy spending my money but I’m good with laying out for this project, I know I will make excellent use of the shed and greenhouse and it will all be worth it. Meanwhile, the weeds grow largely unchecked and my veggie garden lags – I’m trying not to fret about it, keeping in mind the gardeners mantra; there’s always NEXT year! 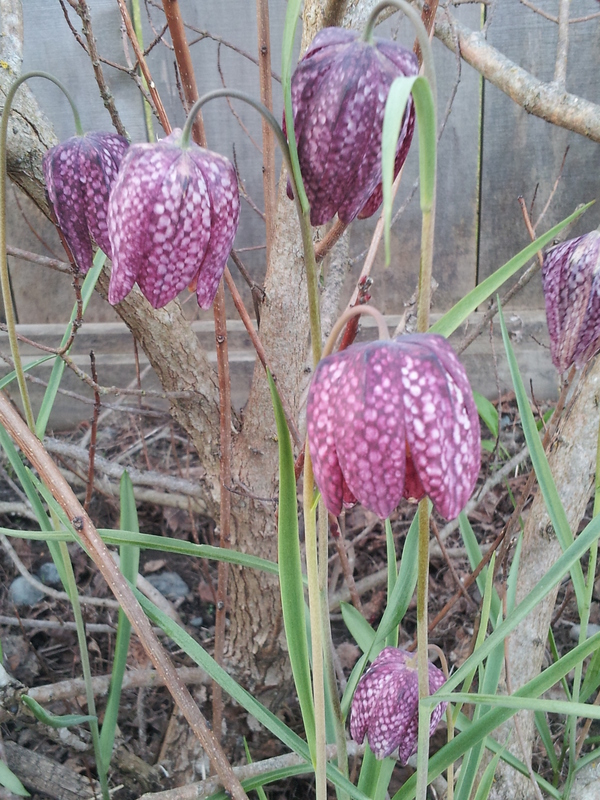 Fritillaria meleagris, commonly called snakes head lily or (as I prefer) checkerboard lily is an exquisite spring blooming member of the family Liliaceae. A bulbous perennial native to Europe, it can be found in the wild anywhere between southern England and western Russia wherever conditions suit it. 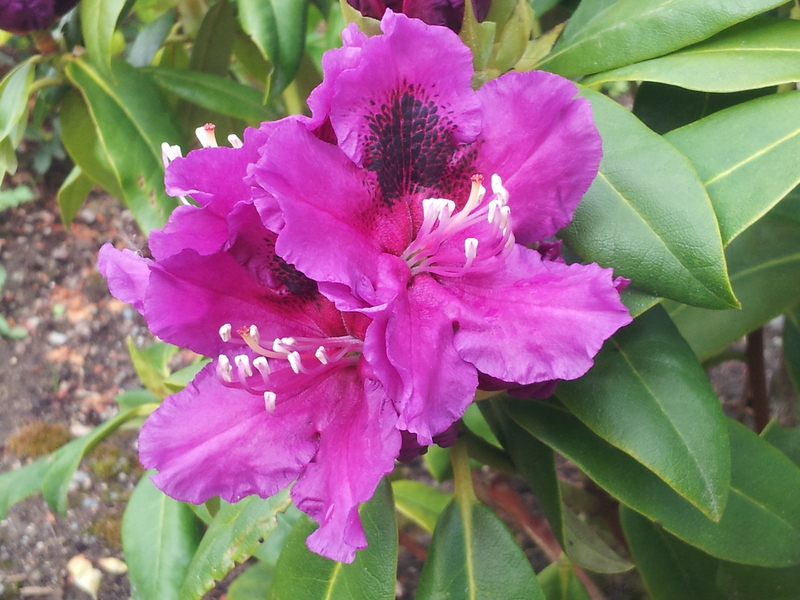 In late March or early April, depending on the weather, these lovely purple and mauve checked blooms elbow their way up, jostling each other for space to hang their nodding heads. Occasionally a white bloom will emerge from the purple crowd, like a ghostly cousin. 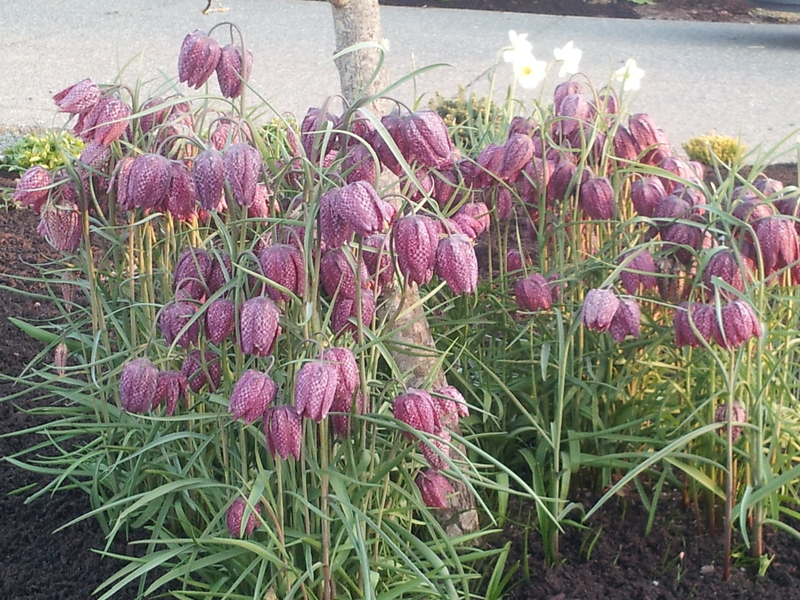 This particular fritillary enjoys full sun or partial shade and humus rich, moist but well-drained soil and appreciates some water during summer months. Apparently, conditions suit it quite well around here. I planted a few bulbs several years ago under my sourwood (oxydendron arboreum) tree, which was at the time growing in an old oak half-barrel. When we moved to our new home I planted the sourwood and it`s hitchhiking checkerboard lilies in the front garden, as it was supposed to be deer resistant. 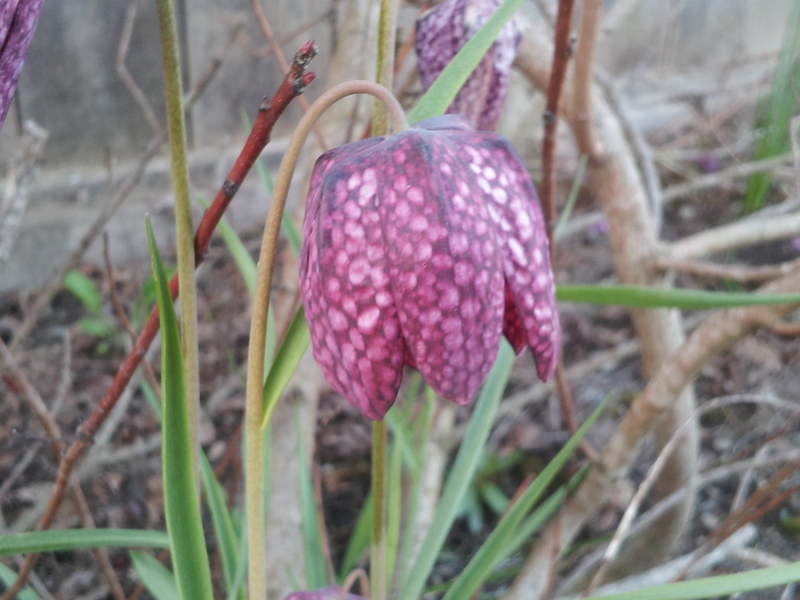 It turns out that deer don`t mind sourwood leaves and the tree is struggling to gain any size as the beautiful vermin prune it vigorously every summer, but the fritillaries are never nibbled, and are spreading quite happily! In fact, a couple of years ago one sprung up in the backyard, under my smokebush (cotinus coggygria) and now IT is multiplying. And a few more are popping up in random spots around the yard. They must be spreading by seed because I haven`t moved any bulbs around. 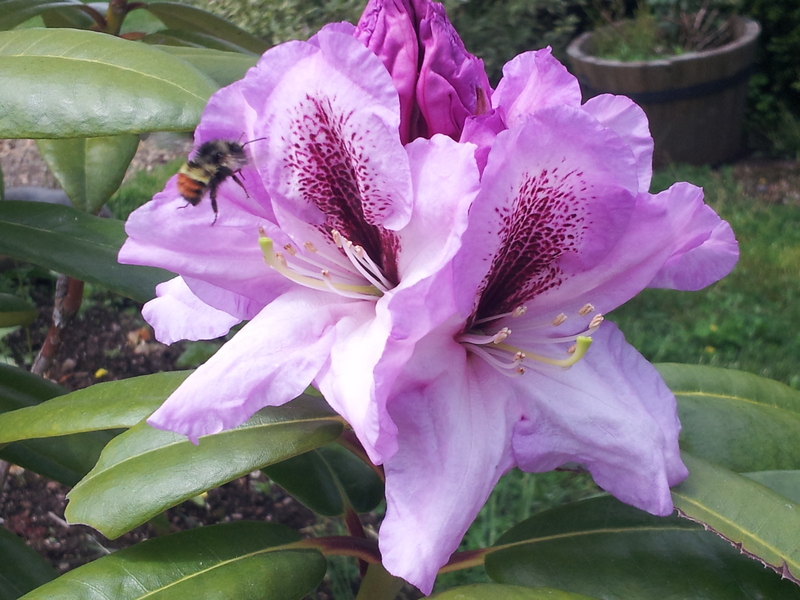 I`m just starting to worry that I might have a thug on my hands, but such a beautiful thug! 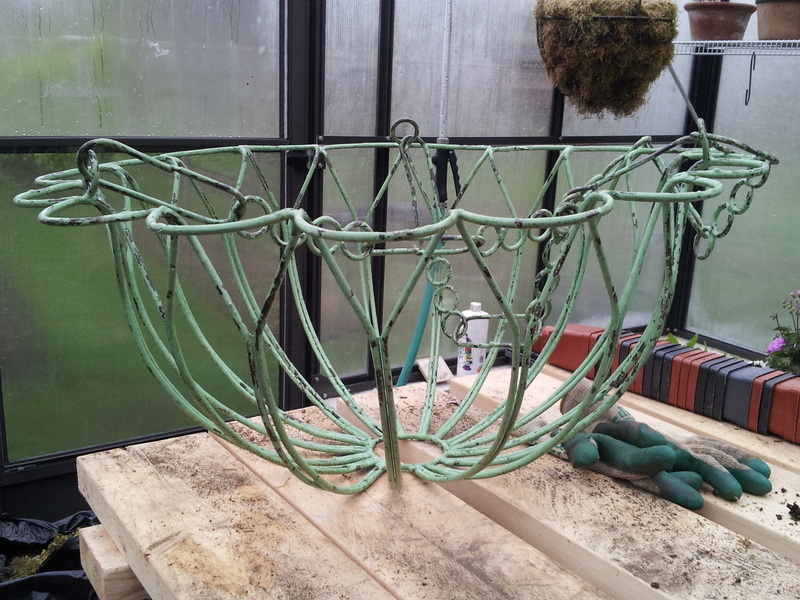 My new greenhouse project proceeds at a snail’s pace, just as I expected it would. 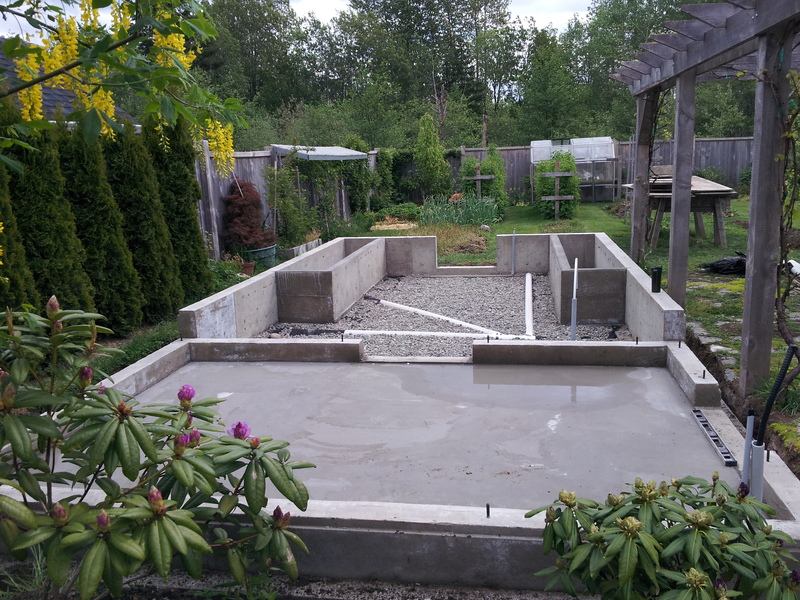 My husband assures me that once the foundation is in it will move much more quickly, right now I’m practising patience, a virtue that I’m trying to cultivate. 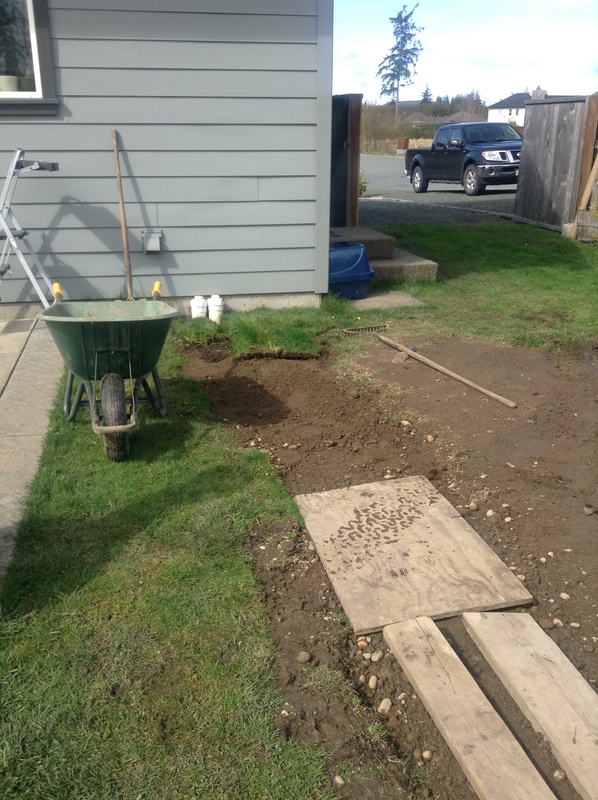 Last week the plumber and electrician visited and we now have services out to the building site, and the drainage/service ditch filled back in. I spent part of my weekend replacing the sod over the ditch, patchwork fashion. When we removed the sod earlier this year we laid the chunks out on bare ground in the flowerbeds, but they needed removing because winter-dormant bulbs and perennials are threatening to emerge through the grass! 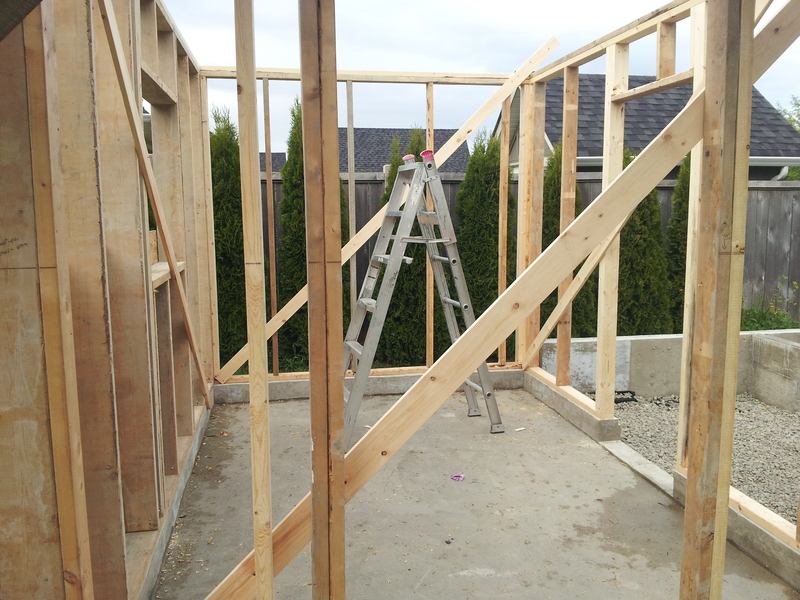 Hopefully this weekend will see some construction of forms, but then we have a couple of busy weeks so I don’t know exactly when we’ll have a chance to pour cement. In the meantime I’ve been working on acquiring some second-hand materials to lend character to the shed. 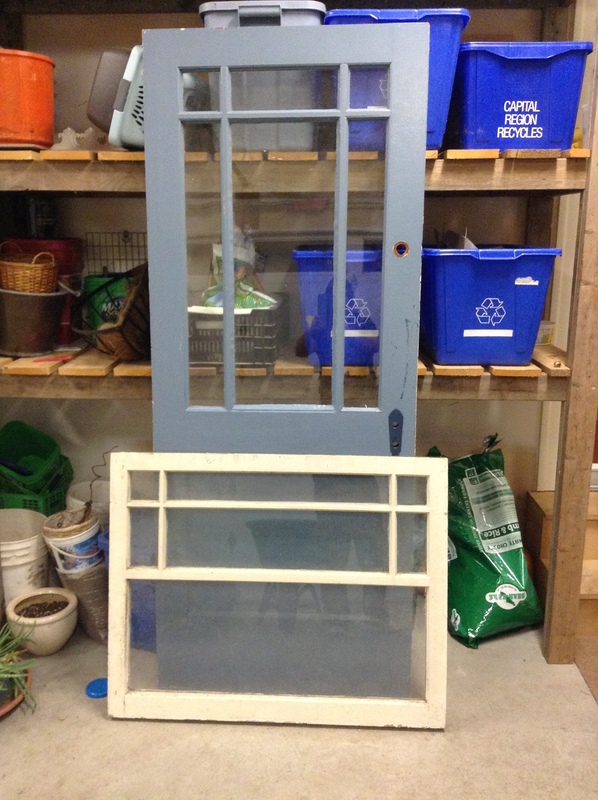 Several weeks ago while I was visiting family in Victoria, I picked up a couple of vintage doors, a knob set and an old window for my construction project. 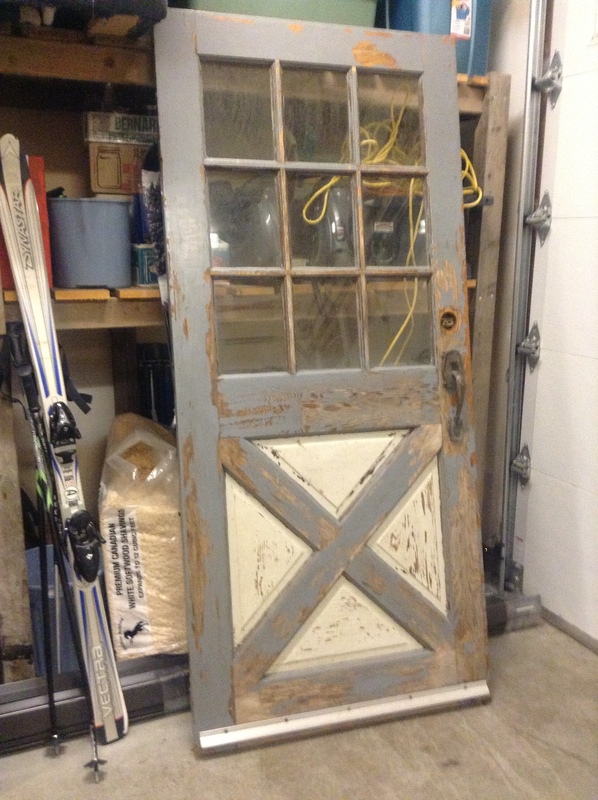 One of the doors, the knob set and the window all date from the 1920’s and I’m super excited about how they’ll look together. 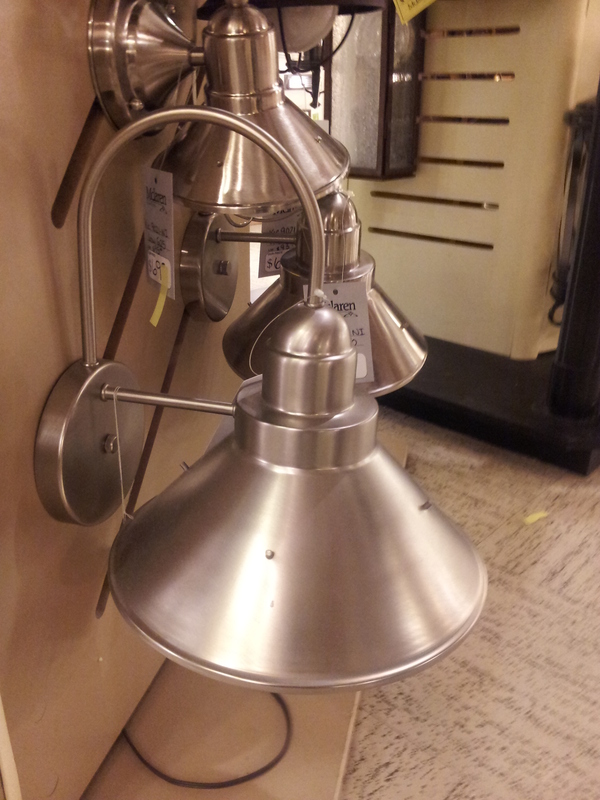 I also purchased a new light fixture – after checking out some vintage fixtures I decided I’d rather have something that didn’t need re-wiring or threaten to burn my shed down! 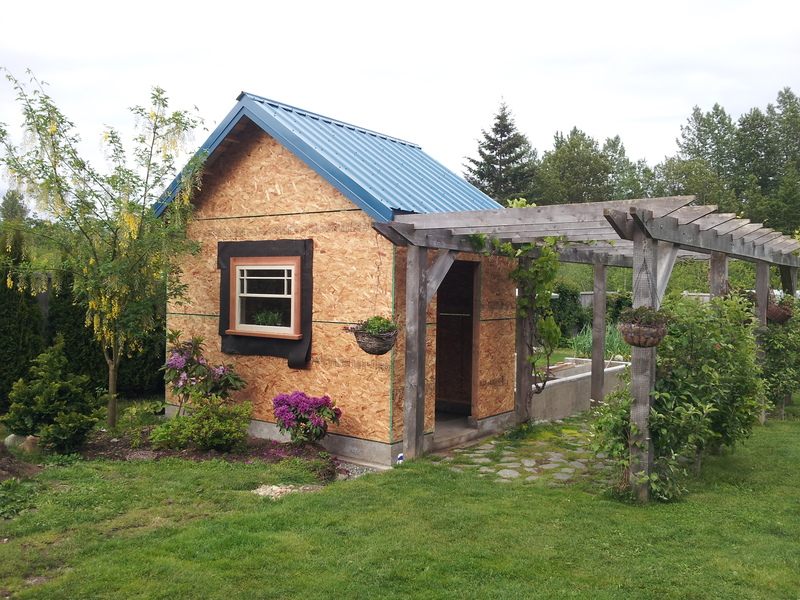 I’ve been pondering roofing materials, siding and paint colours and dredging the internet for inspiration. 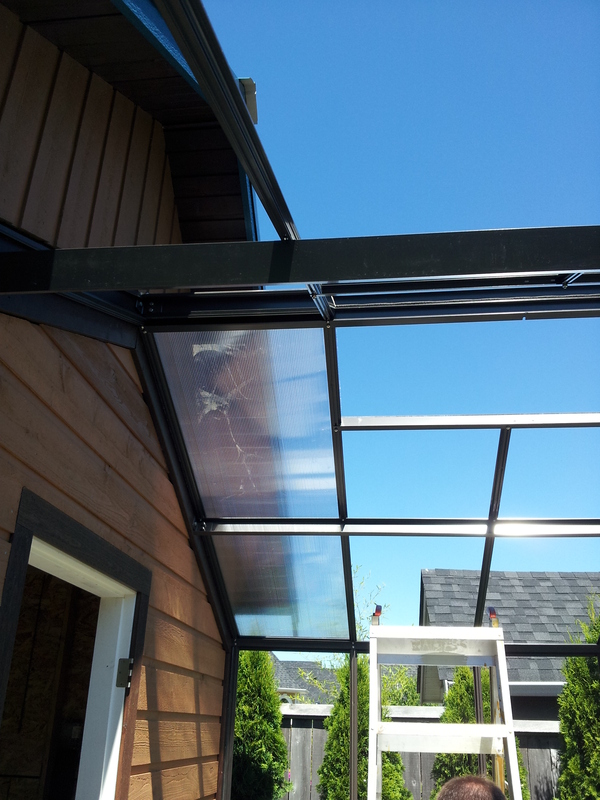 I’m leaning towards metal roofing for its durability and the fact that it comes in a plethora of vivid colours.